GIGABYTE's latest mid-range offering, the GA-P67A-UD4, has a lot to offer the end user at a very respectable lower price range. 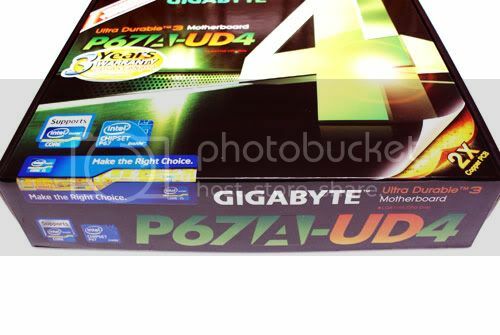 I am excited to see how the new chipset stacks up against last years P55 motherboards, this review will be covering many aspects of performance offered by the P67A-UD4 in comparison to the older P55 chipset. 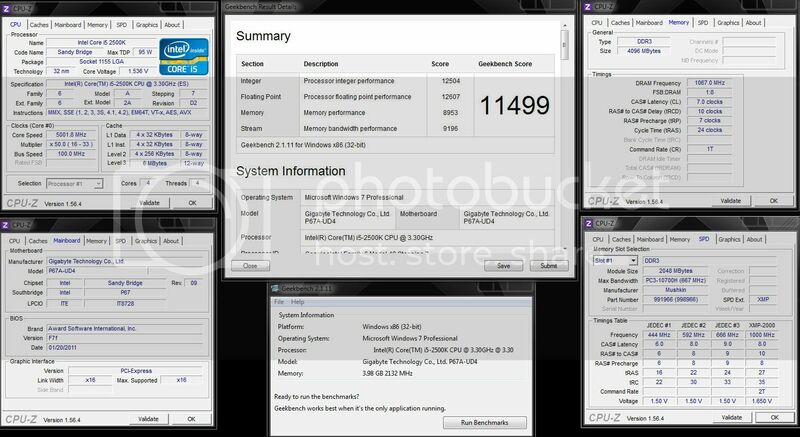 This will entail several benchmarks that cover processor and memory performance, and graphical performance comparisons will be included as well. I will also be showing how the new Intel based SATA 6Gb/s performs with the insanely fast Crucial C300 6Gb/s SSD, this is one of the features I looked forward to most in the P67 series. 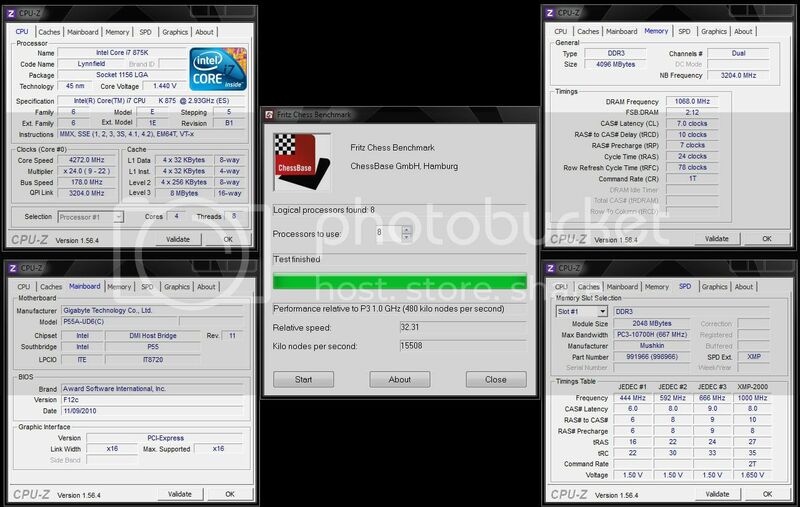 Midway through my data collection process for this review I learned of the Intel Series 6 Chipset recall, due to a faulty SATA 3Gb/s component in the P67 chipset. This design flaw does not affect overall motherboard performance in any way, and is only limited to affecting the 3Gb/s SATA ports. 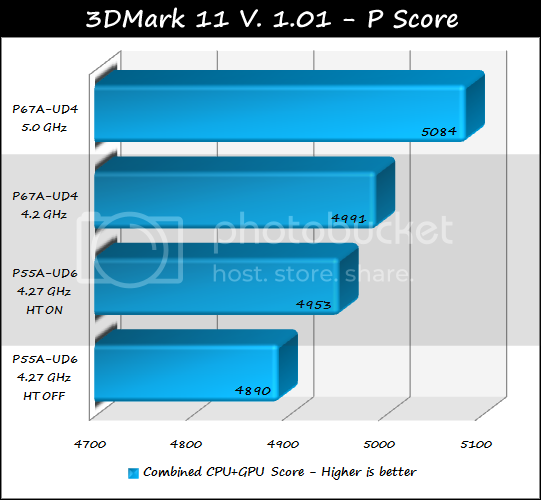 This will be discussed in further detail at the end of the review, for now we will venture onward and see how the GA-P67-UD4 stacks up against last years P55 chipset. 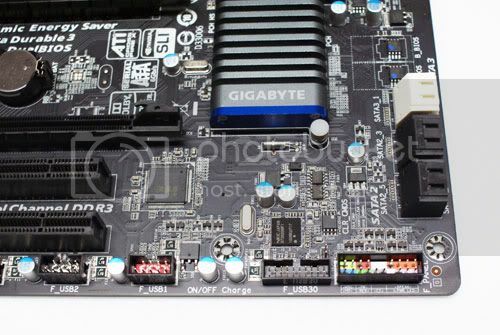 Let's learn a little bit about GIGABYTE before we get into the review. GIGABYTE has over 20 years of manufacturing knowledge, thriving on delivering the latest technology to users around the globe. They develop, test, and manufacture a wide range of products following strict quality and environmental control standards. Their reputation as a pioneer in motherboard innovation has allowed them to diversify their product range to include graphics cards, notebooks, desktop PCs, PC components, cellular phones, server and datacenter solutions, and more. GIGABYTE was founded in 1986 in a small lab by four young engineers passionate to make their mark on the industry. GIGABYTE remains dedicated to the core belief of improving the lives of our users by manufacturing products that are high-performing, reliable, and of excellent quality. * A USB 3.0 host controller (NEC) which is 10x faster than USB 2.0. * 3x USB Power Boost delivers superior compatibility and stability for USB devices, such as external storage devices or optical drives, by supplying sufficient power through a single USB port. 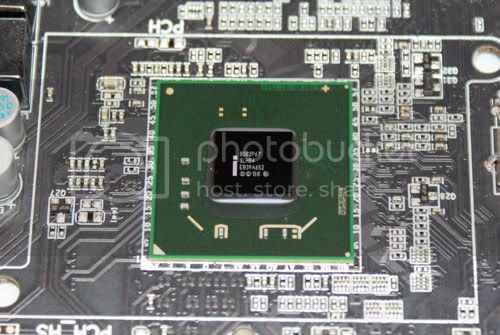 * SATA 3.0 connection to double the performance of the hard disk. 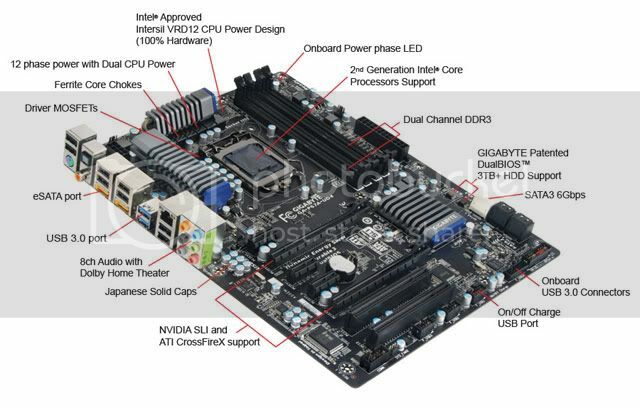 Ultra Durable™ Technology: First motherboard manufacturer to implement the following technologies. Proprietary analysis system that selects the highest quality GPUs destined for deployment on the Super Overclock Series graphics cards. Docking Netbook The Booktop (10”, M1022) is the first Netbook to include its own docking station for dual purpose use: lightweight portability and full-featured desktop functionality in the cradle. 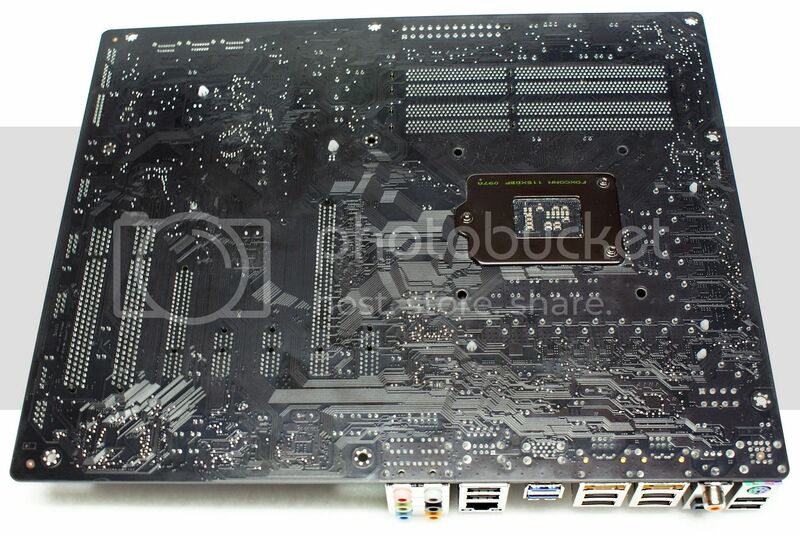 In addition, the 13” M1305 is the world’s first notebook to include a GPU inside a docking station. This provides an ultra-thin form factor as well as excellent graphics performance when plugged in at home or in the office. 2. 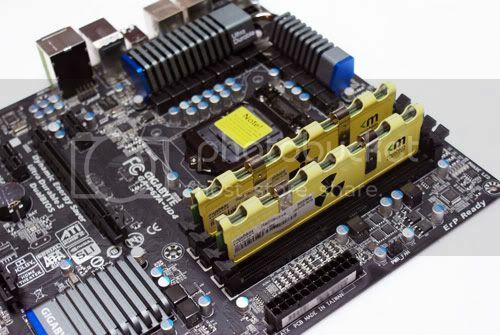 1 x PCI Express x16 slot, running at x8 (PCIEX8) * The PCIEX8 slot shares bandwidth with the PCIEX16 slot. When the PCIEX8 slot is populated, the PCIEX16 slot will operate at up to x8 mode. 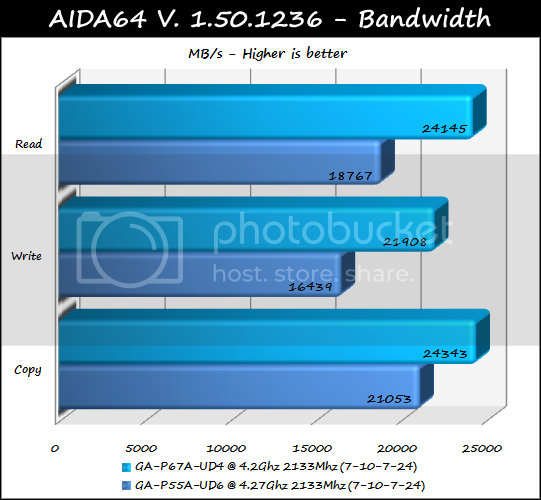 * When a RAID set is built across the SATA 6Gb/s and SATA 3Gb/s channels, the system performance of the RAID set may vary depending on the devices being connected. 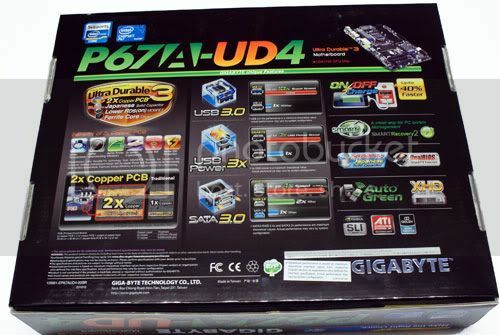 The front of the UD4 packaging is designed mainly in green and black, noting this is a Ultra Durable 3 motherboard and the model name, 2X Copper PCB, and that the board offers unlocked performance. 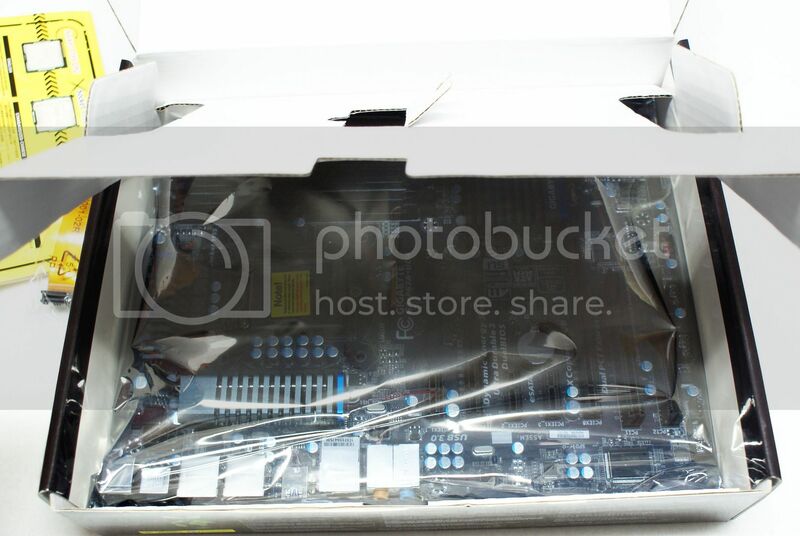 There is also a few Intel logos indicating this is a P67 series chipset motherboard. 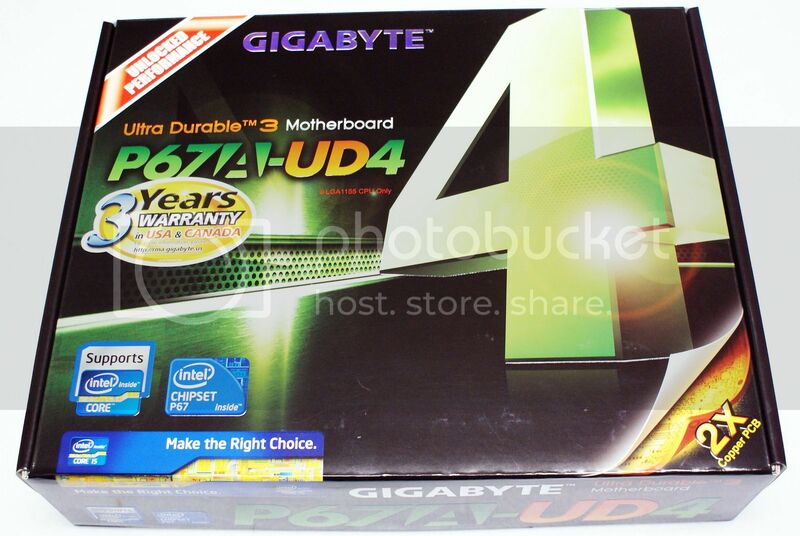 Three year warranty is also noted on the front of the box, this is for USA and Canada only. 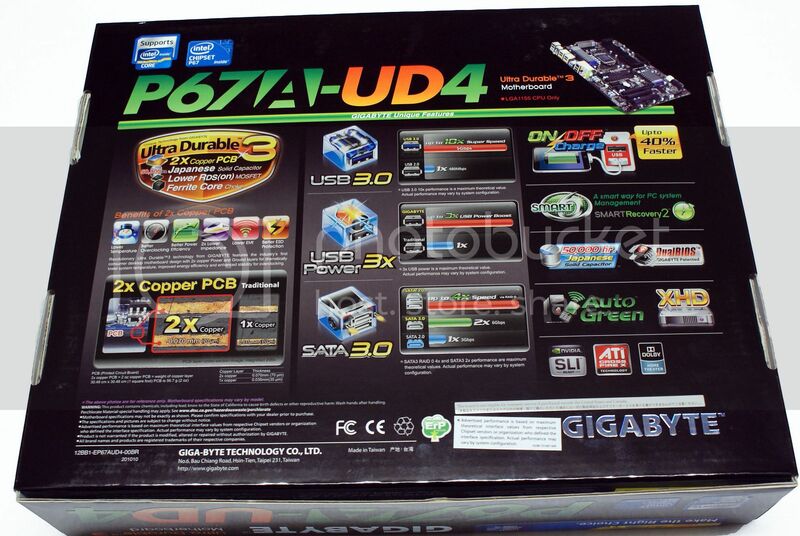 On the back of the box many of the motherboard features are detailed. 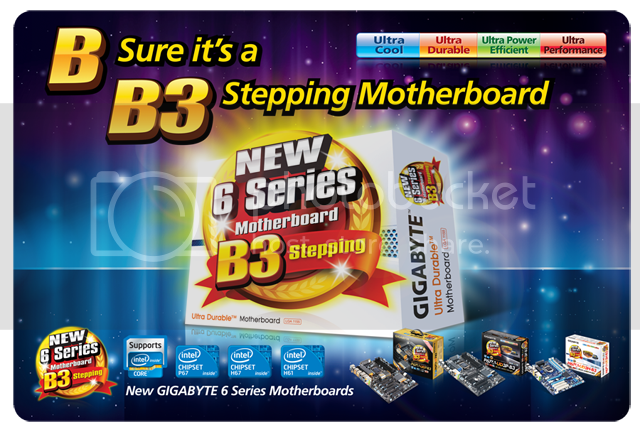 GIGABYTE's main technology points described are Ultra Durable 3 (Featuring 2x Copper PCB), on-board 333 acceleration (USB 3.0, 3X USB Power delivery, and SATA 3.0). 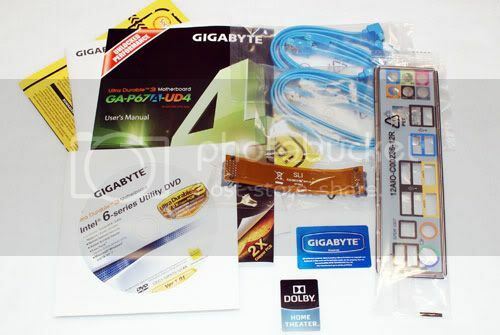 3-way graphics is noted as well, along with ON/OFF charge, Smart 6, 50,000 hour capacitors utilized, dual BIOS, Auto Green, and XHD (Xtreme Hard Drive). On the bottom of the box the label simply shows the model name again, along with Intel logos. 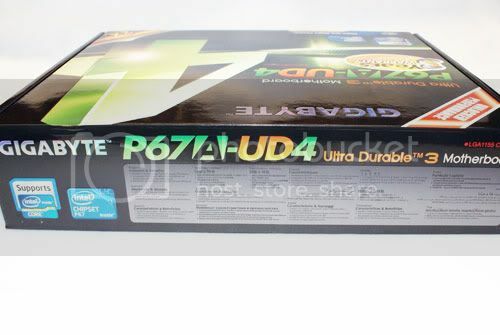 On the side you have much of the same logos again, and the product UPC label indicating some of the product specifications, serial numbers, and the product revision number. On the top of the box, in several languages, 3 major benefits of the board are noted (Ultra Durable 3, USB3 and SATA 6Gb/s, and USB ON/OFF charge for phones and other USB Devices). Inside the box under the included accessories we find a protective inner flap that securely houses the motherboard underneath. Included accessories with this motherboard are blue SATA cables, an SLI cable, I/O shield, and the usual motherboard manuals, install CD, and stickers. 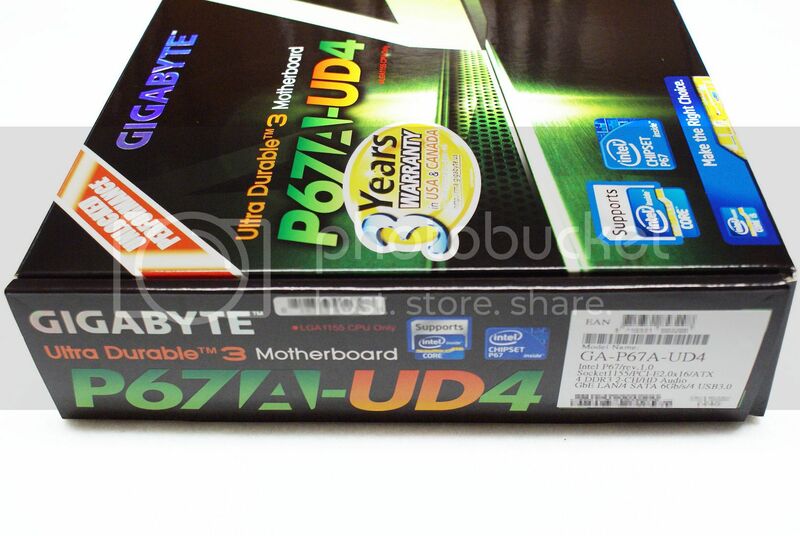 Here you can see the GA-P67A-UD4 in full, exhibiting the new matte black PCB from GIGABYTE. 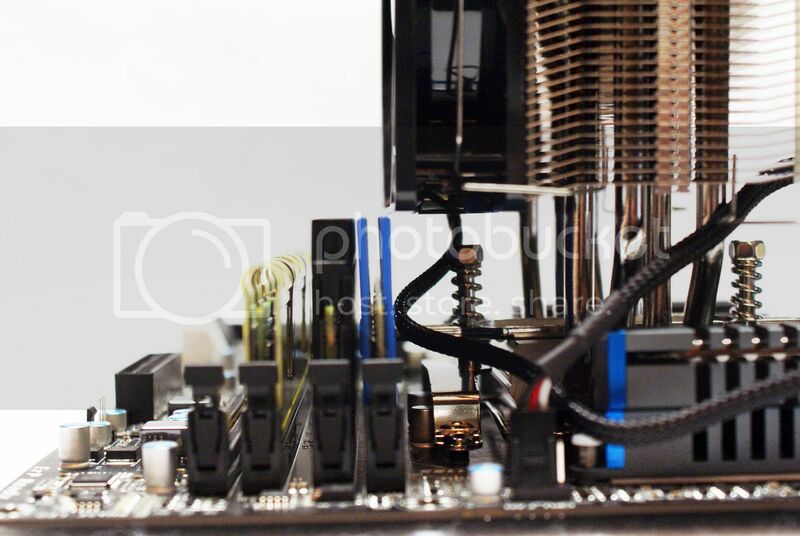 The color scheme is almost all black, having only a few blue accents on the heatsinks, which are designed in a shade of gray. On the SB heatsink in white is the GIGABYTE name, Ultra Durable is noted the I/O side mosfet heatsink, also in white. 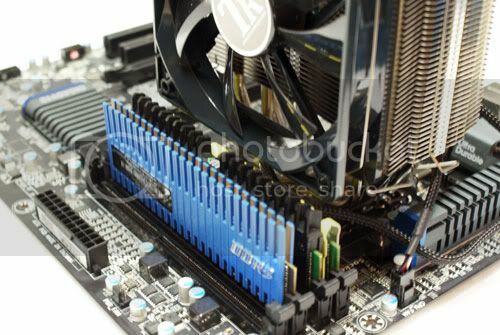 GIGABYTE used all black memory and PCI/PCIE slots to match the black PCB. 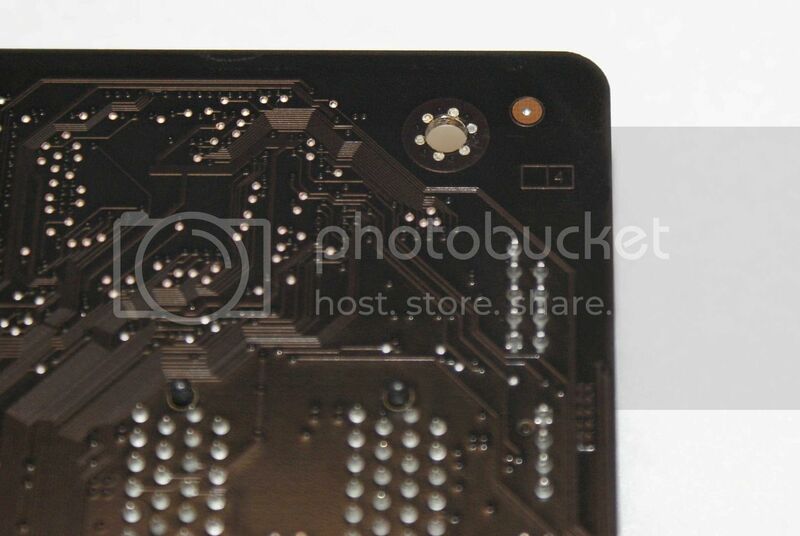 On the reverse you can see that plastic push-pins attach the mosfet and PCH heatsink. 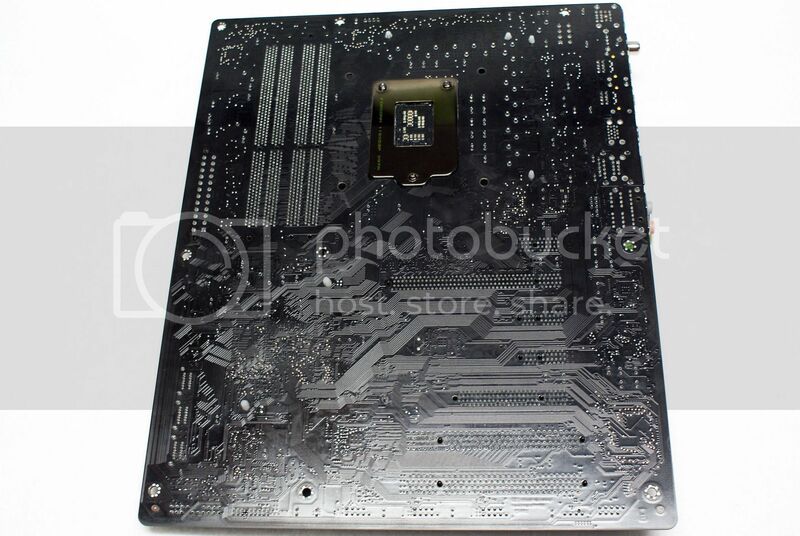 You can also see that the new matte black PCB from GIGABYTE is simply that, black, without ugly brown copper traces showing through. 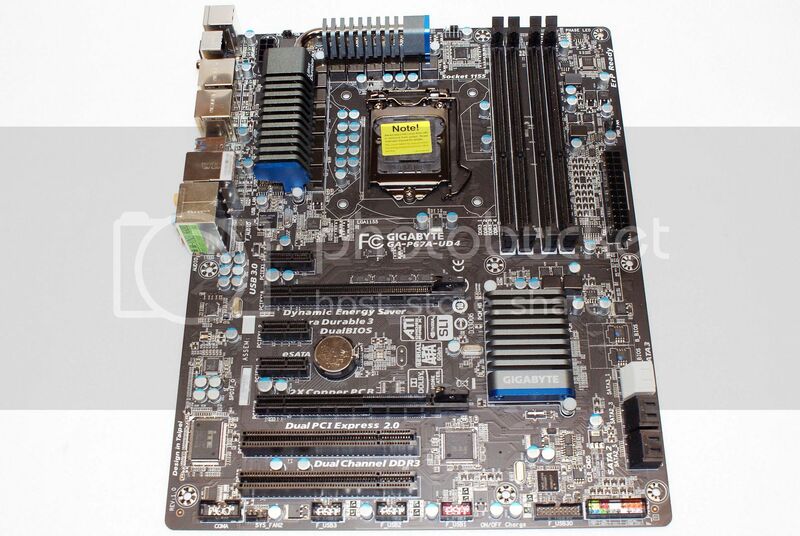 That brown showing through on many black PCB boards makes me cringe. 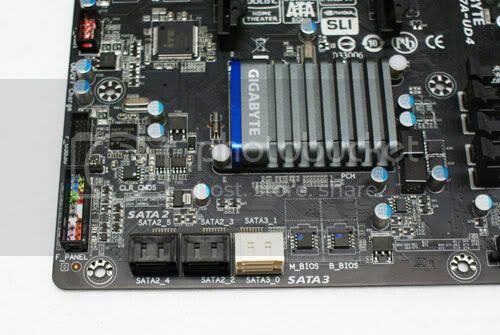 GIGABYTE is on the right track with their implementation of black matte PCB. Here you can see the dual BIOS chips, and the 6 internal SATA ports. Two of the ports are 6GB/s Intel controlled ports, and the other four ports are Intel 3Gb/s, these latter 3Gb/s ports are those affected by the B2 chipset issues causing the recent recall by Intel. 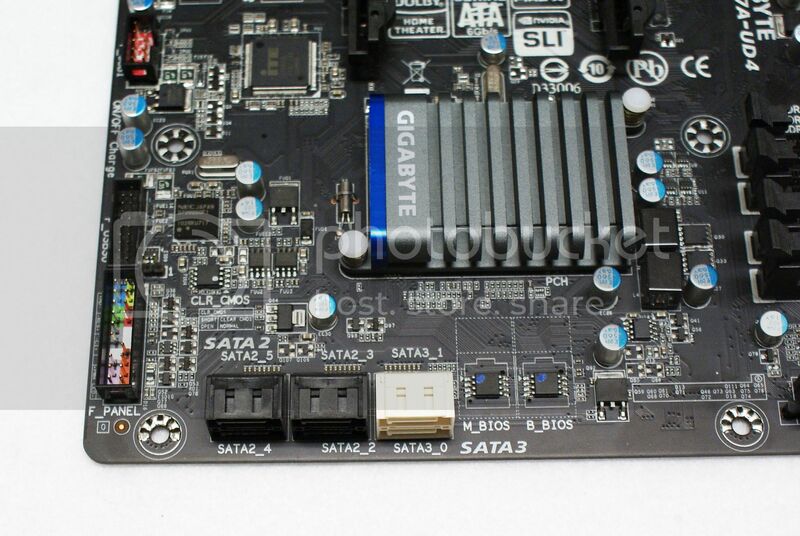 You can see there is a front USB 3.0 connector, however, there are no front panel USB 3.0 bay devices included with the motherboard. I am unsure how end users are supposed to take advantage of this feature, but it is nice to know it's there for future use. The I/O panel is feature full! Offering a mouse or keyboard PS2 connection, 1 optical and one coaxial S/PDIF connector, 8 USB 2.0/1.1 ports, 2 USB 3.0 ports, 2 eSATA 6Gb/s combo ports, one LAN connection, and 6 x audio connections supporting up to 7.1 channel HD audio. 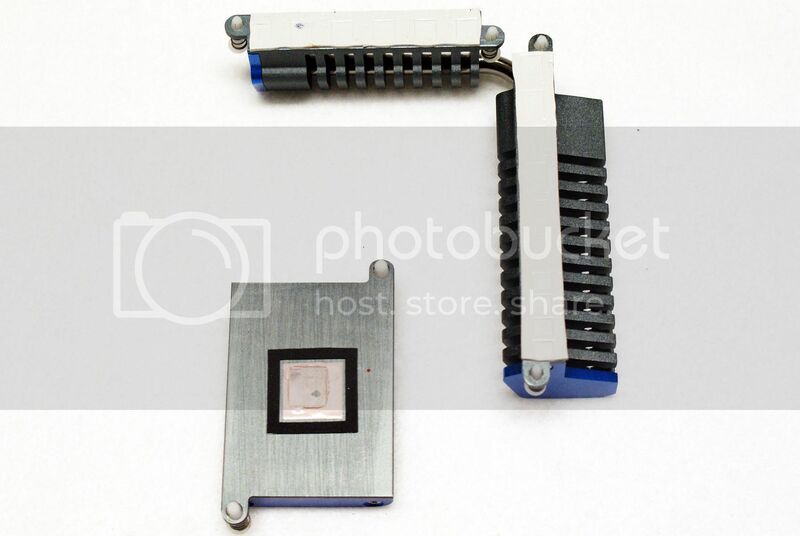 Here you can see the Intel P67 PCH chipset, and that the heatsinks and heatpipe combo has been removed. 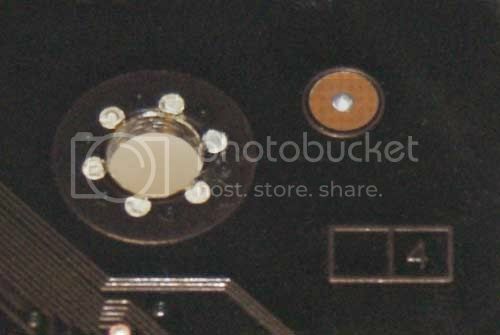 On the bottom we can see that pink thermal paste was used to secure the PCH heatsink to the P67 chip, this was very sticky and almost gum like. The heat from the driver mosfets is transferred to the heatsinks and heatpipe via thermal padding. 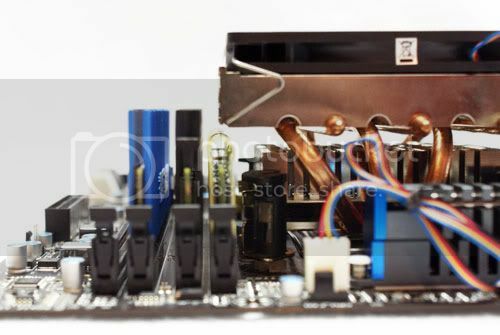 Here is full detailed shots of the board with the heatsinks removed, click to enlarge if you would like to see anything up close and personal. I do not have the technical skills to go in depth and discuss each IC or chip used on the board, but if you are interested or knowledgeable about these things and would like to know what products are used you can easily view them all from these images. 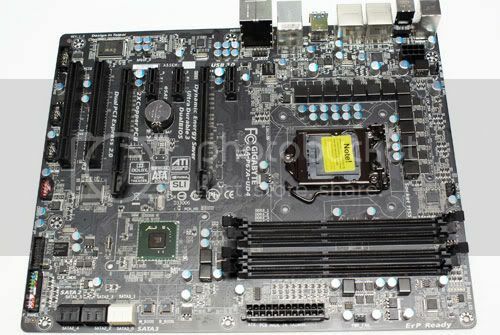 Here is the CPU socket area bare, you can see GIGABYTE's 12 Phase VRM power design for the CPU, and the new driver mosfets are also used. Noted on the reverse of the board you can see that this board uses an 4 layer PCB design. Last edited by Lsdmeasap; 03-11-2011 at 08:34 PM. I used a Scythe Shuriken for this shot, to show a low profile cooler being used in order to allow you to see that if using larger memory modules there may be an issue. 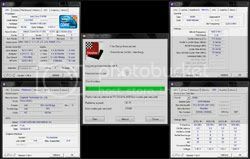 You may have fitment issues with the first or possibly even the second memory slot, depending on what memory and cooler you are thinking of using. This shows normal installation and fan placement on a Thermalright MUX, I have not used a Thermalright Extreme (TRUE) or other variants, but I assume that they have a similar fan placement. In the normal fan position larger memory modules may cause issues or be pushing against the fan if using a fan on the memory side of the heatsink. 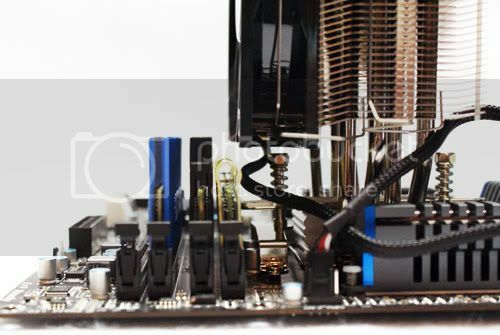 It could also cause memory installation issues depending on the order you install everything, however, as you will see below with most of the tower type CPU coolers like this you can adjust the fan's placement. By simply adjusting the memory side fan on this cooler, to be slightly raised from normal position, allows for much taller memory modules to be used without an issue. You will be able to remove and re-install memory with your fan adjusted in this position without any problems. 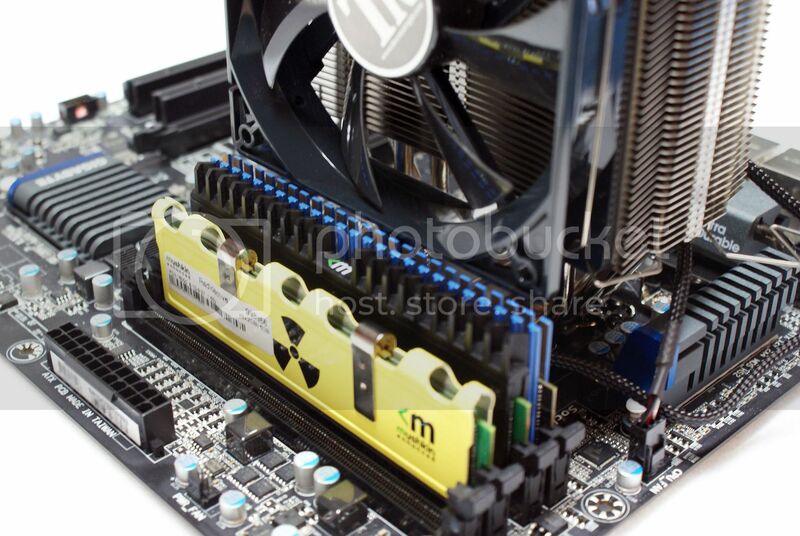 This first image shows the Mushkin Radioactive memory kit used for this review, it matches well with the black PCB. You can see that the black Ridgebacks look good as well. Blue or red memory heatsinks on your memory? Well then, yes, they will look great installed on this board and will match up very nicely with the black PCB. The blue would match more uniformly than the red, of course. 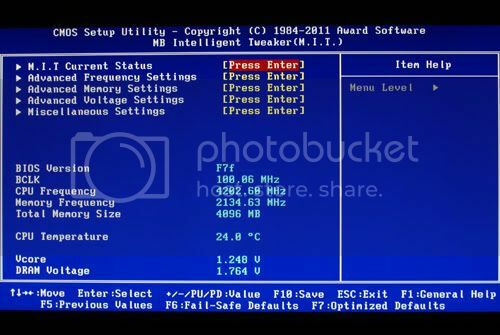 As you can see, GIGABYTE's BIOS offers a quick and easy way to check the current status of your CPU and memory, the information also notes each core's turbo status. 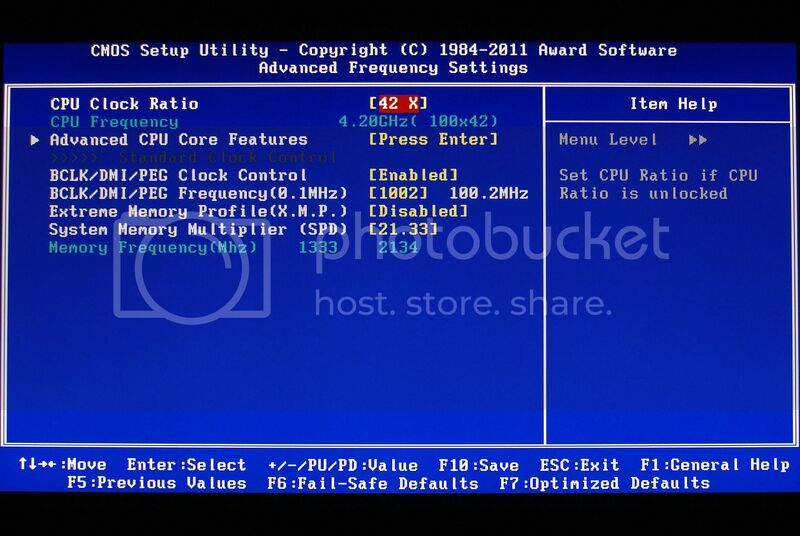 The BIOS version along with CPU and memory frequency & total size are shown as well. 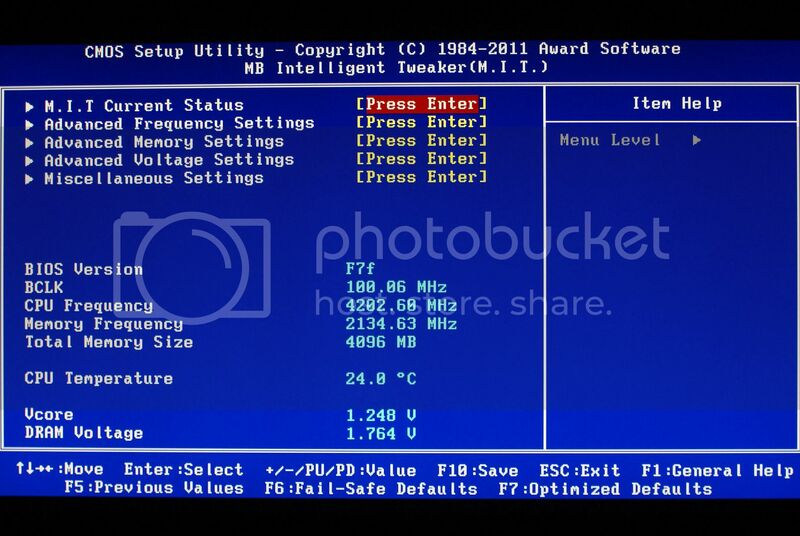 The current CPU temperature is shown, as is the current Vcore and Dram voltage. 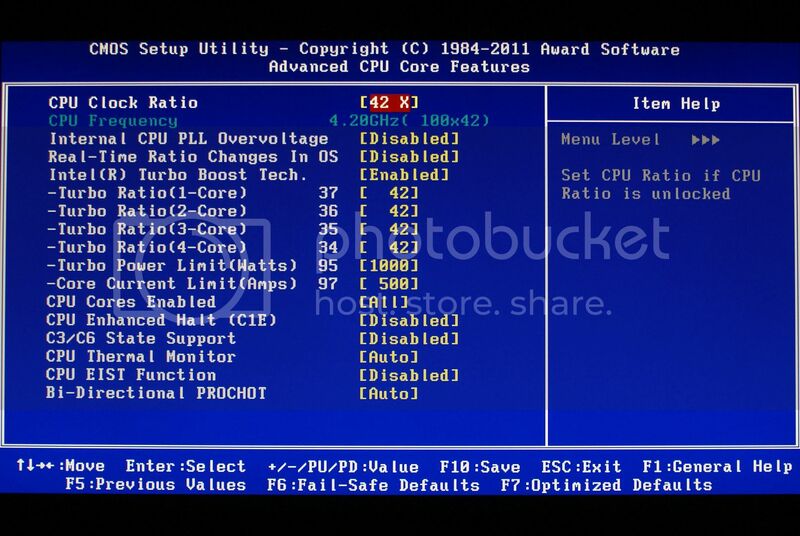 This is the main overclock section of the BIOS, allowing you to adjust the CPU multiplier or FSB speed, and giving the options to set the memory speed or enable XMP settings. 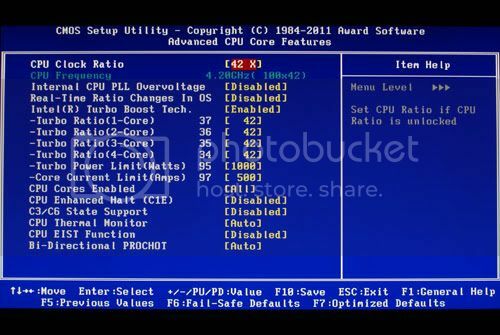 GIGABYTE now also has per core CPU multiplier adjustments in the advanced CPU core settings section, along with enabling or disabling real time multiplier changes in the OS. 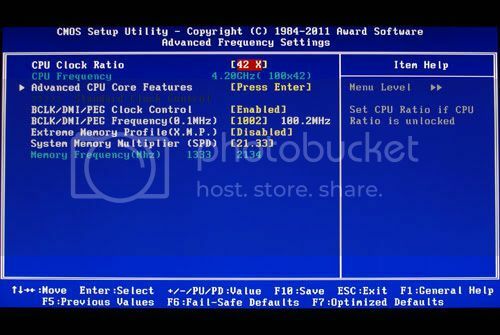 Internal CPU PLL adjustment setting allowing higher CPU multiplier is currently only available in Beta BIOSes. 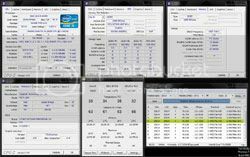 Here you can see GIGABYTE offers MANY advanced memory timings that can be manually adjusted. 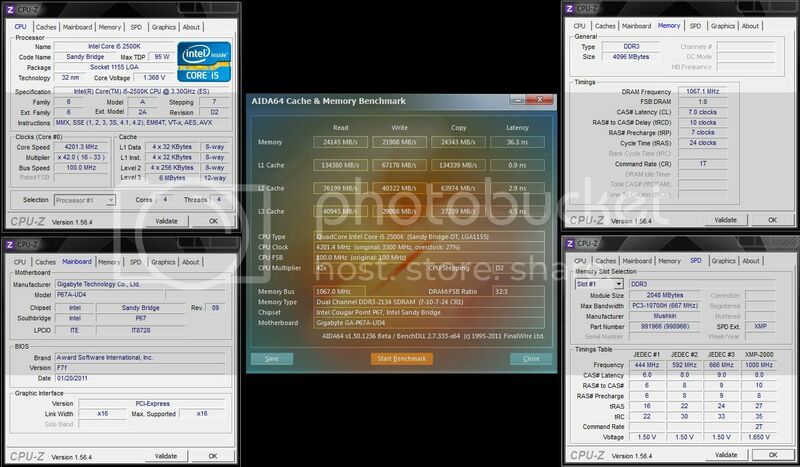 There are several other advanced memory timings are available as well, however, they are not shown in these images. 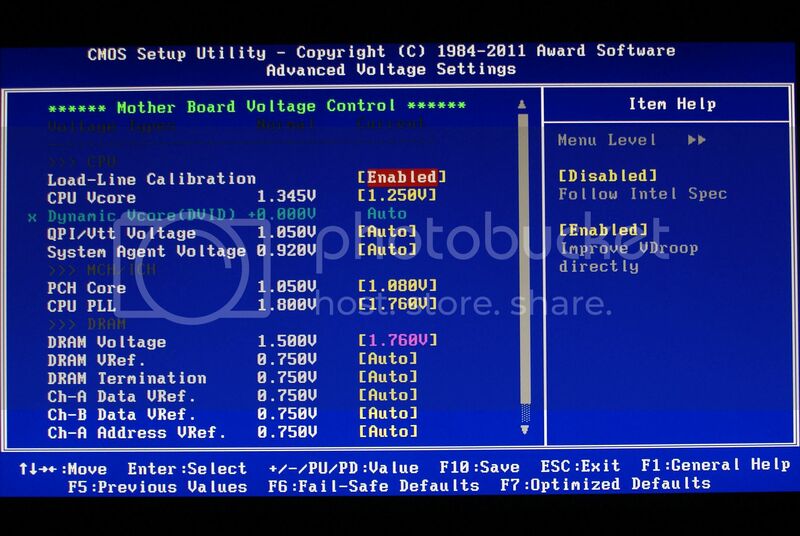 This board offers 3 Load-Line Calibration settings (Auto, Disabled, or enabled), not as many choices as the top tier boards but at least you still have some control on vdroop. 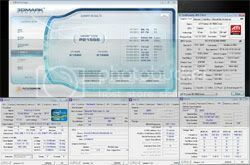 In the Advanced Voltage section you can adjust the Vcore, QPI/Vtt, System Agent Voltage, PCH voltage, CPU PLL, memory voltage along with several memory voltage sub options. 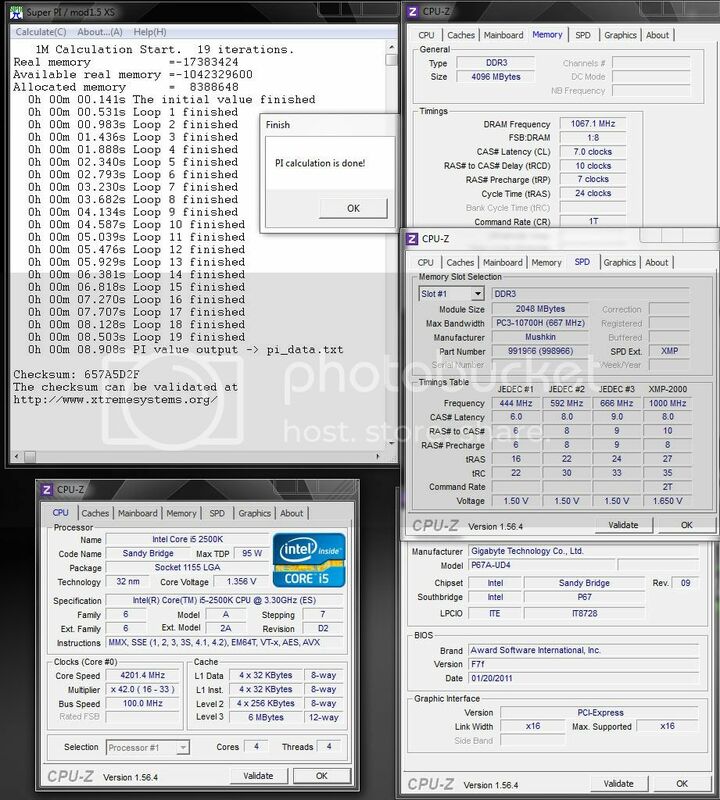 * Increments may vary between CPU models, I know ES and Retail vary on this board, and I have seen 1366 CPU's that vary between models as well. 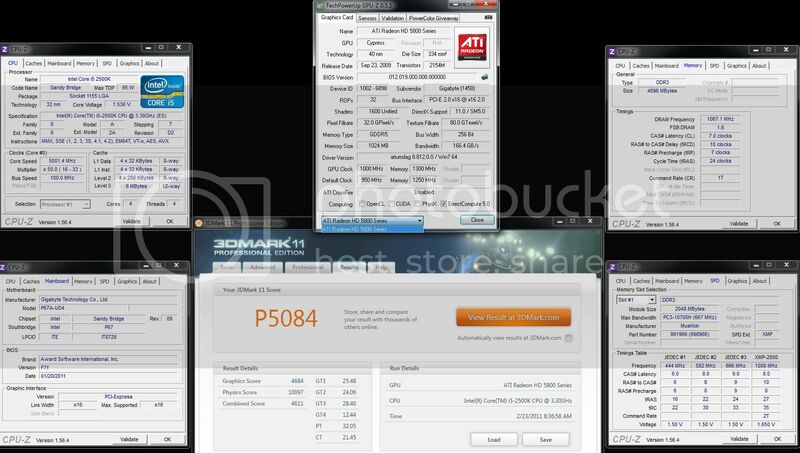 Futuremark is the world leader in 3D, mobile and PC benchmarking. 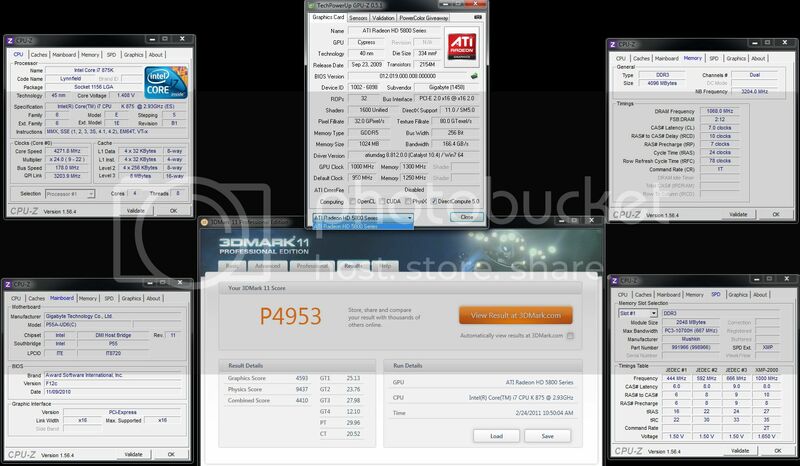 Our 3DMark and PCMark lines of PC benchmark software. 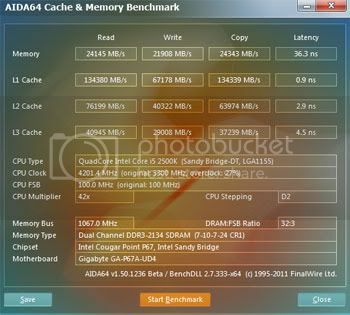 3DMark06 is a PC benchmark suite designed to test the DirectX9 performance of your graphics card. 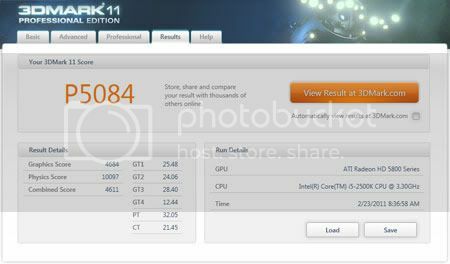 A 3DMark score is an overall measure of your system’s 3D gaming capabilities, based on comprehensive real-time 3D graphics and processor tests. 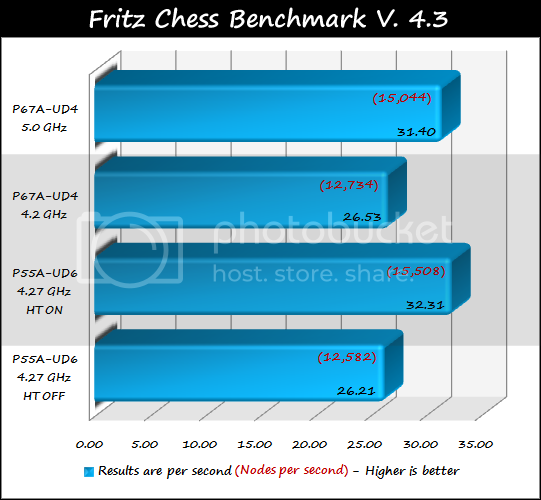 This benchmark runs an internal chess based test on your system and give you values for the speed relative to a benchmark processor (P3, 1.0 GHz) and the average nodes-per-second count which you can compare these values for different hardware configurations. 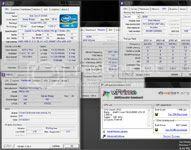 SuperPI is a quick reference benchmark test often used when overclocking or comparing different hardware configurations. 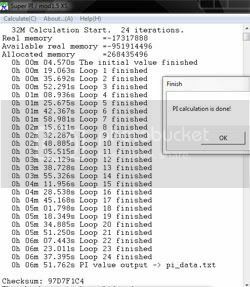 Super PI is a computer program that calculates pi to a specified number of digits after the decimal point - up to a maximum of 32 million. It uses Gauss–Legendre algorithm and is a Windows port of the program used by Yasumasa Kanada in 1995 to compute Pi to 232 digits. 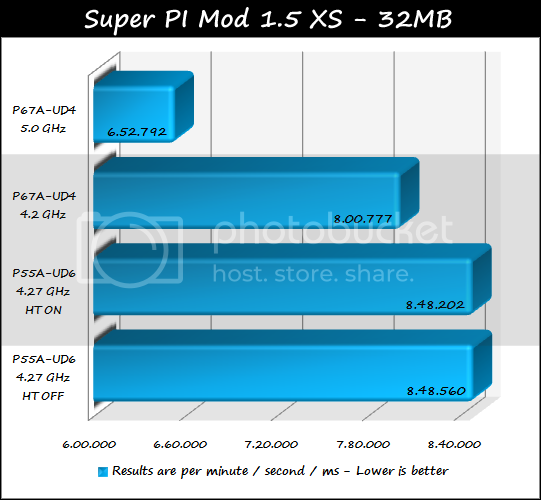 Super Pi is used by many overclockers to test the performance and stability of their computers. 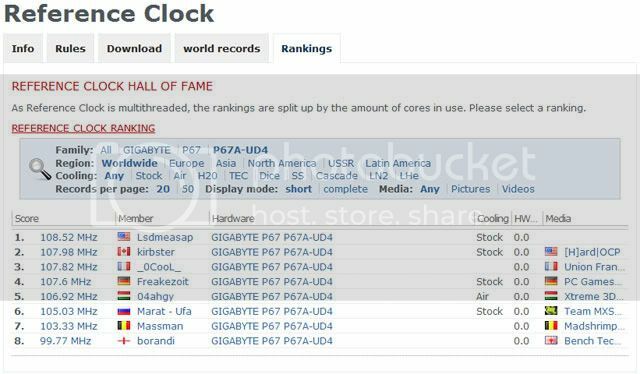 In the overclocking community, the standard program provides a benchmark for enthusiasts to compare "world record" pi calculation times and demonstrate their overclocking abilities. 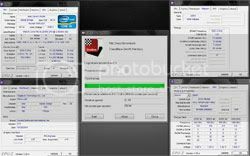 The program can also be used to test the stability of a certain overclock speed. If a computer is able to calculate PI to the 32 millionth place after the decimal without mistake, it is considered to be moderately stable in terms of RAM and CPU. However, longer tests with other CPU/RAM intensive calculation programs will run for hours instead of minutes and may better stress system stability. 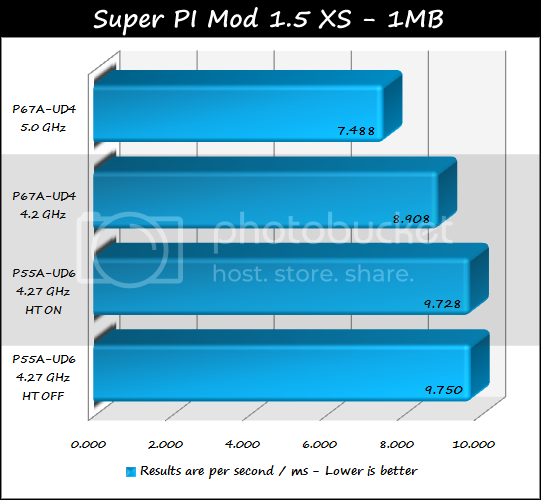 While Super Pi is not the fastest program for calculating Pi (see software for calculating p for faster alternatives), it remains very popular in the hardware and overclocking communities. 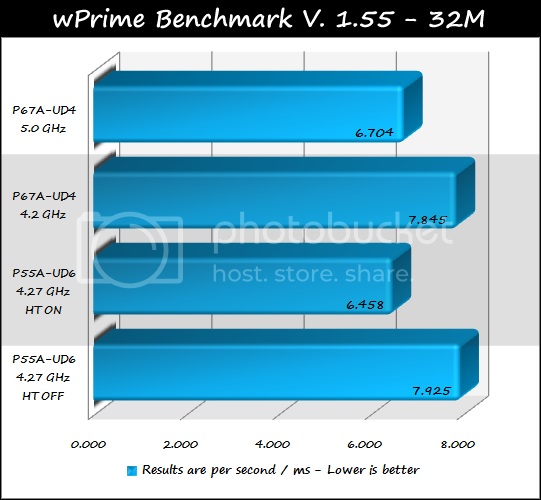 wPrime is a leading multithreaded benchmark for x86 processors that tests your processor performance by calculating square roots with a recursive call of Newton's method for estimating functions, with f(x)=x2-k, where k is the number we're sqrting, until Sgn(f(x)/f'(x)) does not equal that of the previous iteration, starting with an estimation of k/2. It then uses an iterative calling of the estimation method a set amount of times to increase the accuracy of the results. It then confirms that n(k)2=k to ensure the calculation was correct. It repeats this for all numbers from 1 to the requested maximum. Previously known as Everest Ultimate, this also is a great program, and everyone should have a copy. It is not so much a testing tool for our purposes, but it provides multiple stability tests, various bandwidth test, and in-depth system hardware information. For this review it will only be used to provide simple bandwidth and latency test results at each frequency. 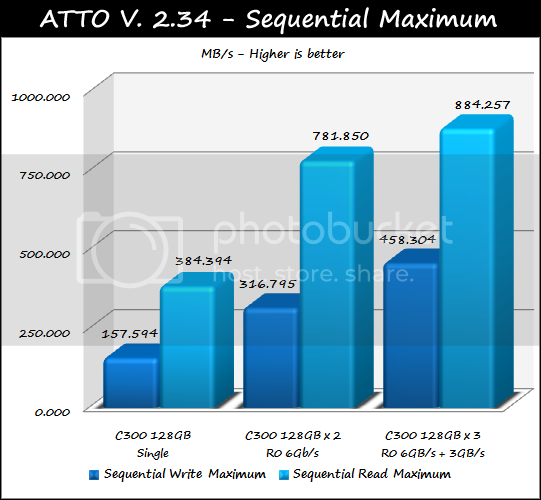 ATTO has been a major disk testing utility for many users, for quite some time, offering the ability to test performance using various transfer sizes and test lengths for reads and writes. It also offers several options to customize your benchmark testing including queue depth, overlapped I/O, a comparison mode and the option to run the test continuously. This benchmark will be used to test SSD and USB performance. 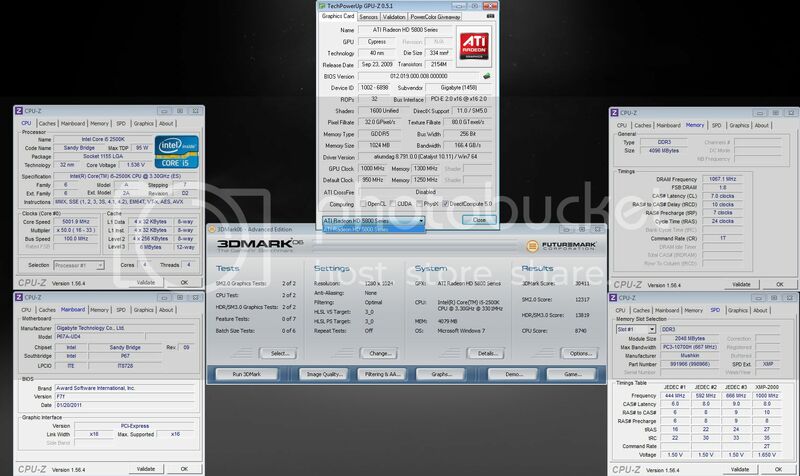 CrystalDiskMark is another staple in the disk benchmarking world, offering measurement of sequential read and writes speeds, random 512KB, 4KB, 4KB (Queue Depth=32). 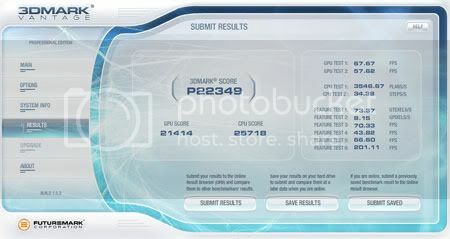 Users may also select the method of how data is tested, random, 0Fill, or 1Fill - in the testing done for this review only the default testing method was used - Random Data. 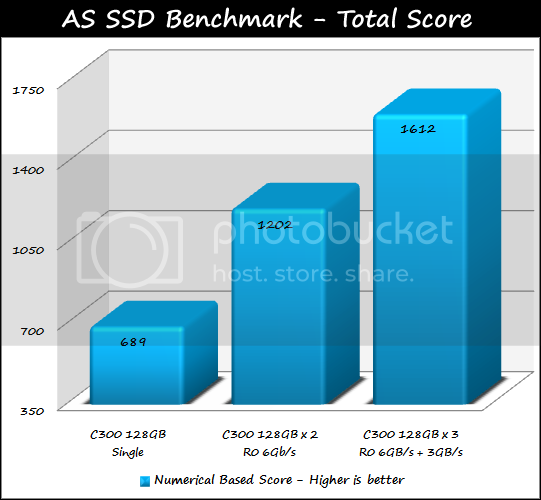 AS SSD benchmark is the latest and most commonly accepted SSD testing program, it determines the performance of solid state drives (SSD) based on many factors. 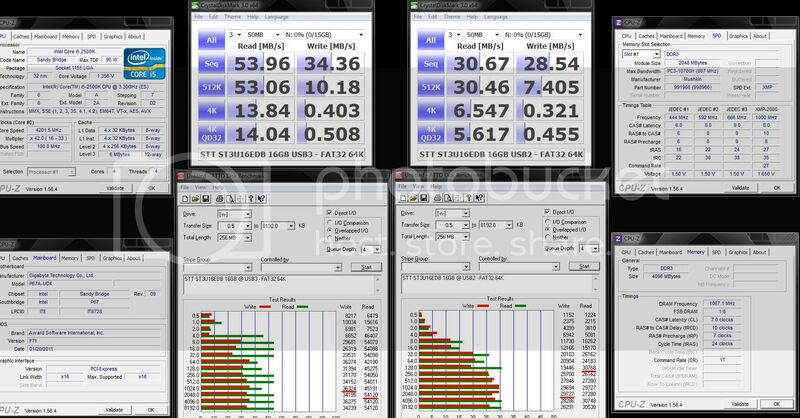 The tool contains five synthetic as well as three practical copy tests (ISO, Program, Games). This tests and measures (In GFlops) your CPU and memory floating point computing power using Intel's LinPack Binaries with linear algebra. Many users consider this program to be a standard of stability, however, often you may see my advice against the use of it in long or large period runs. This program is very hard on systems, and may overheat the CPU, or push it into extremes it would not otherwise see, and can cause unintended permanent damage or degradation. My advice on this program is to use it sparingly, as you will see I only use 10x passes for this review and only at lower CPU frequencies. There are other less harmful ways to test for stability such as Prime95 and HCI Memtest. 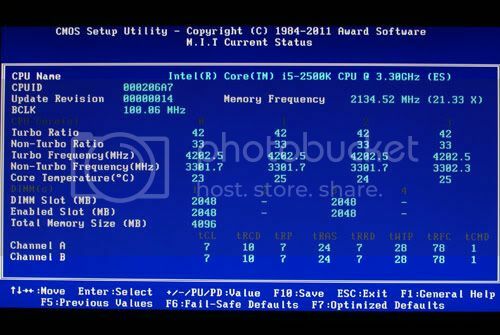 The updated Linpack binaries linked below can be used to update LinX to utilize the latest Intel Linpack instruction sets, including the new AVX instruction set introduced with Sandy Bridge processors. Last edited by Lsdmeasap; 03-09-2011 at 04:42 PM. Please pay no attention to my mess here, I just recently purchased this Torture Rack and was in the middle of three reviews at the time I took this image. The P67A-UD4 and 2500K combo is well ahead of the P55/875K combo hear, even at 4.27GHz with HT on the P55 falls short of even reaching the 2500K's 4 cores at 4.2GHz. 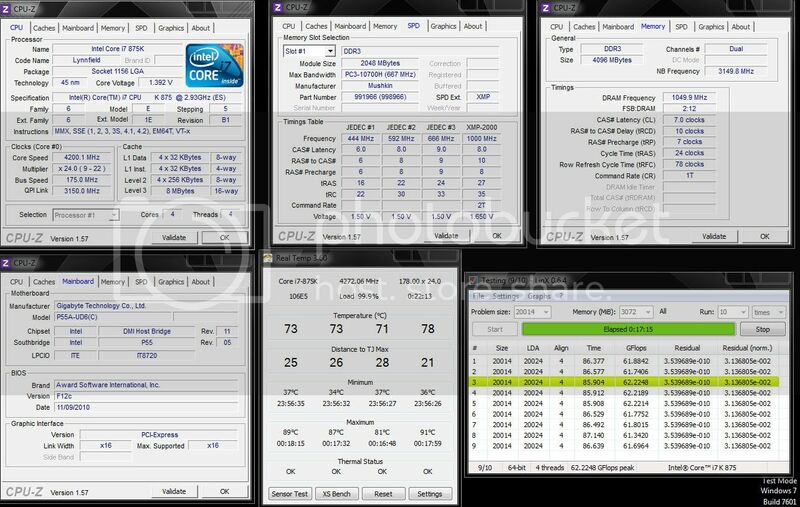 The 875K with HT enabled (8 Cores) does come out ahead of the 4 cores on the 2500K here at 4.2GHz, but when running 5GHz on the P67 setup the HT enabled 875K falls behind. This 5Ghz is possible on water or even modest air coolers, making the P67 an easy choice when it comes to gaming performance. 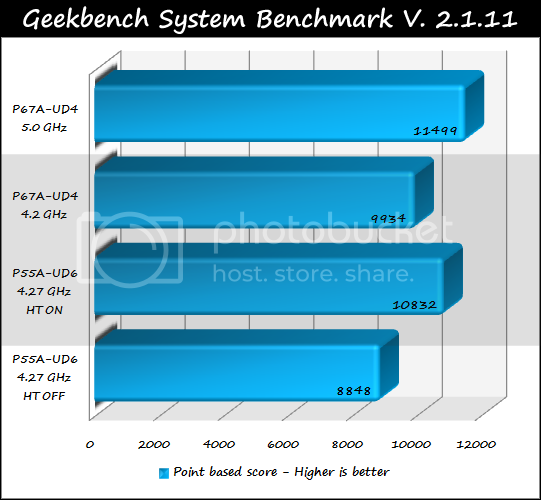 The P67/2500K combo scores ahead of the 875K even with HT enabled, but not by a very large margin as this benchmark scores graphical performance heavier than CPU or memory performance. 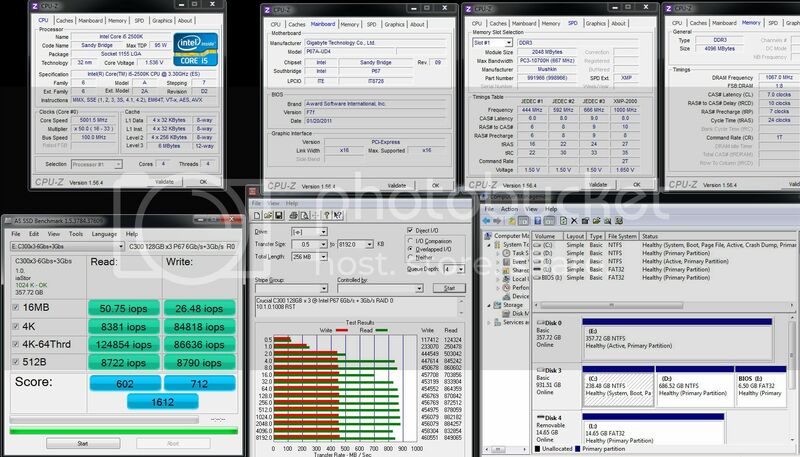 The P55/875K combo scores the highest here with HT enabled by a small margin, even surpassing the P67/2500K combo at 5GHz. 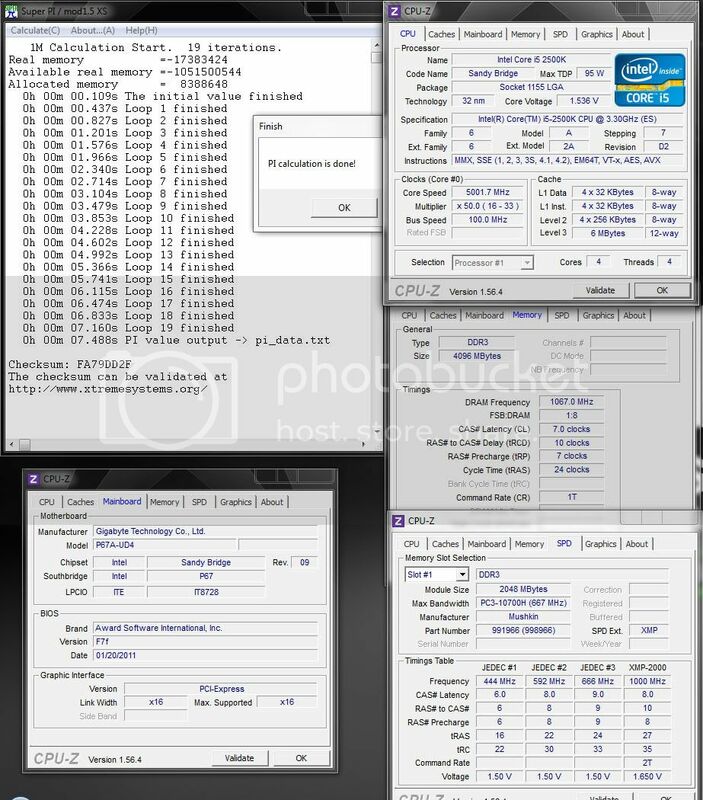 This is mainly due to how this benchmark produces results, CPU cores matter most here, and that is something the 2500K doesn't have to offer when pitted against the 875K's 8 cores once HT is enabled. P67 is not far behind the P55 setup here with HT enabled, and beats it outright with HT disabled. At 5Ghz the P67 system takes the lead easily. P67 and 2500K easily take the win here, coming out ahead of both the 4 and 8 core scores of the 875K. 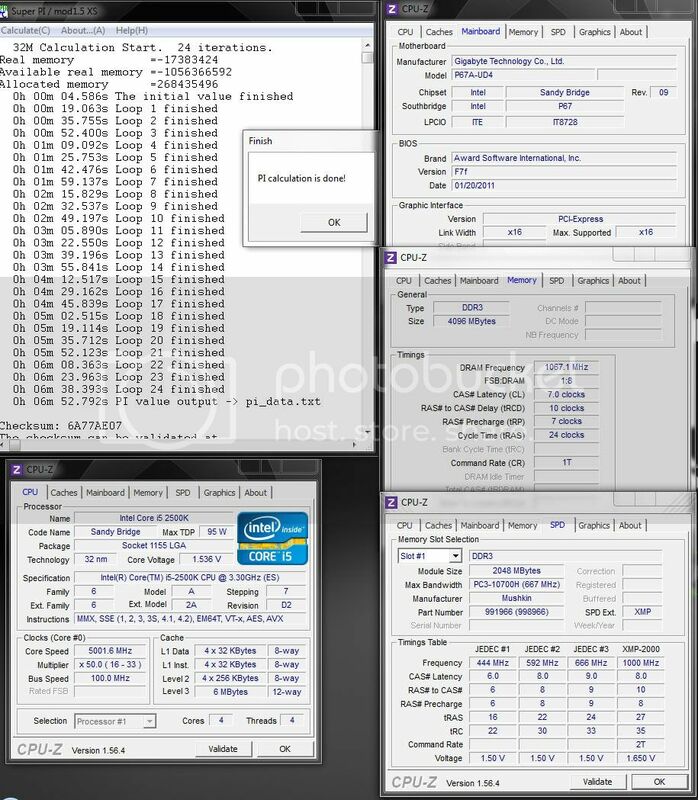 At 4.2GHz the P67 and 2500K are almost a whole second ahead of the P55/875K setup, that small difference is a lot for this test. 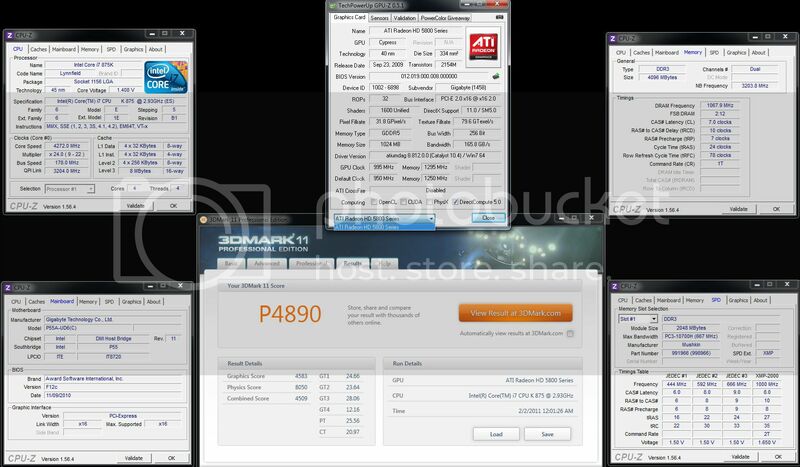 At 5Ghz, the P67/2500K blows the P55 setup out of the competition, winning by almost a full 2 seconds. 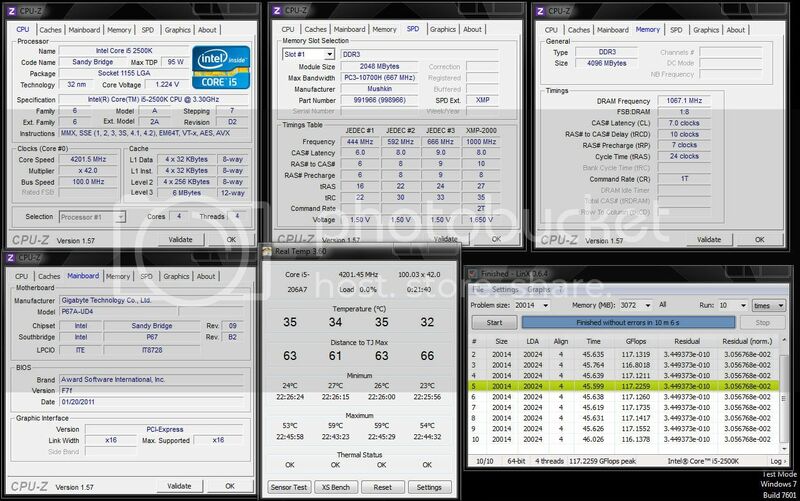 With HT enabled the 875K wins here at 4.2Ghz, but with HT disabled it is a very close competition. 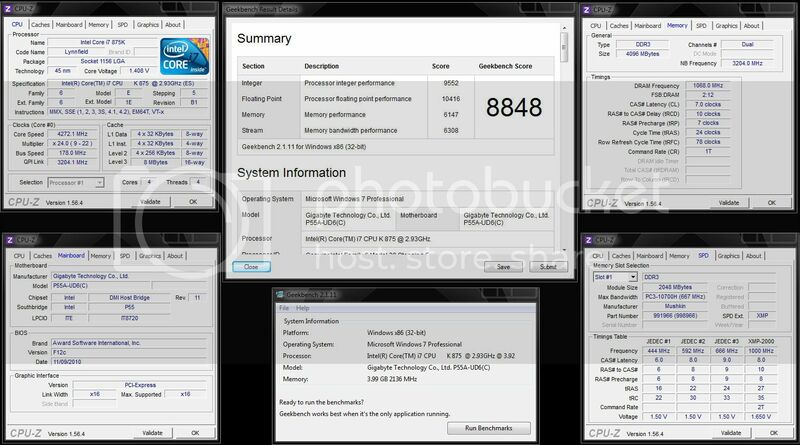 Even at 5GHz on the P67 the 8 cores of the 875K with HT enabled are able to beat the 2500K, meaning this test scores higher based on CPU cores rather than speed or performance. 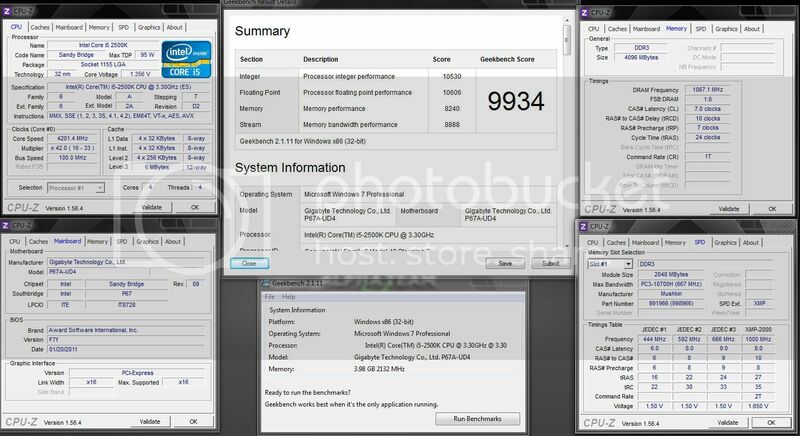 Hyper-threading was enabled on the P55 for this test. 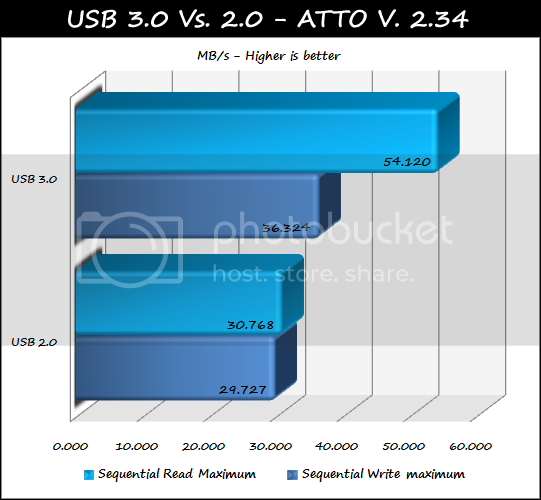 USB 3.0 read speeds are about twice as fast as USB 2.0, write speeds are not nearly as impressive. 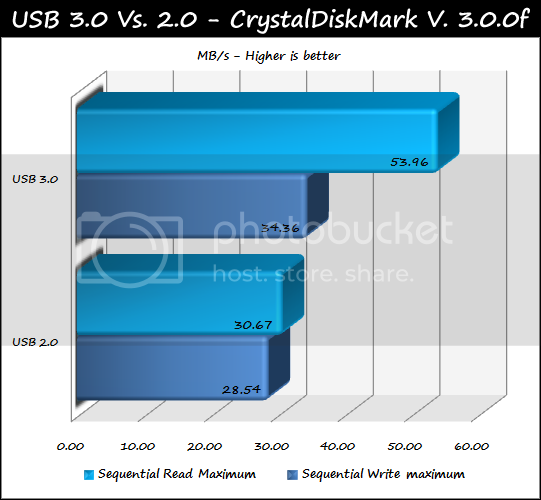 This is using a cheap USB 3.0 drive, just to show how USB 3.0 compares to 2.0. 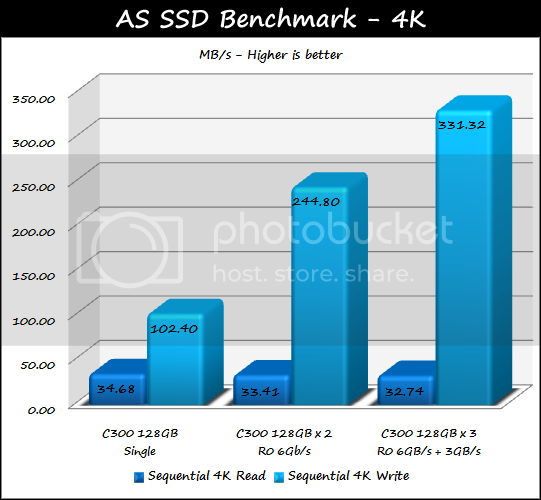 There are much faster USB 3.0 drives, some of the more expensive ones are able to offer speeds that can compete with some solid state disks. 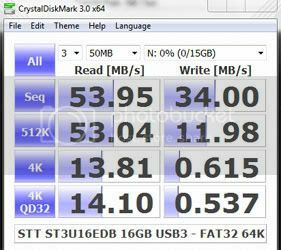 Here again we see the USB 3.0 drive jumps ahead in reads by almost 20MB/s, writes are only 1-2MB/s faster when using USB 3.0. Last edited by Lsdmeasap; 03-09-2011 at 04:43 PM. 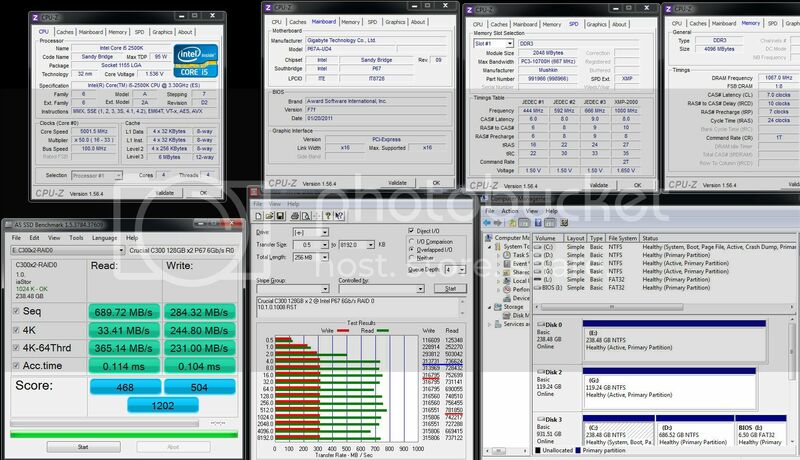 Solid state disks scale very nicely in RAID with this board, especially when using 6Gb/s SSD's in the Intel 6Gb/s ports. 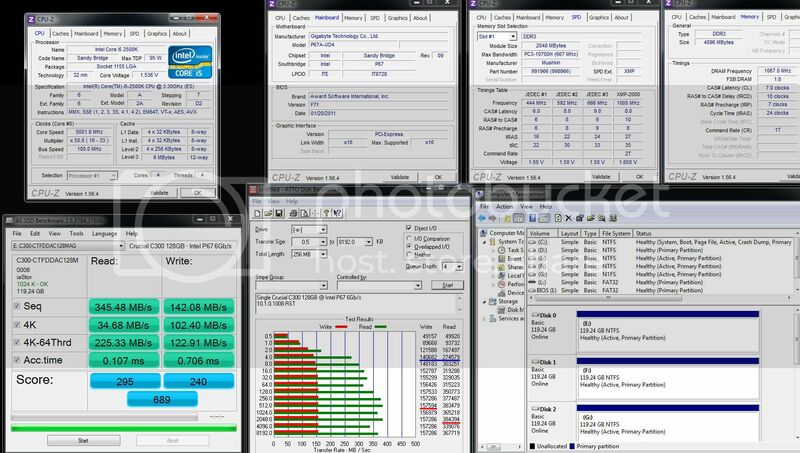 As you can see the very impressive read speeds of almost 890MB/s. 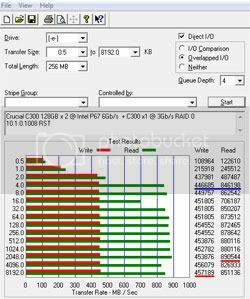 Two drives in RAID 0 at 6Gb/s is about exactly twice the speed of a single drive. 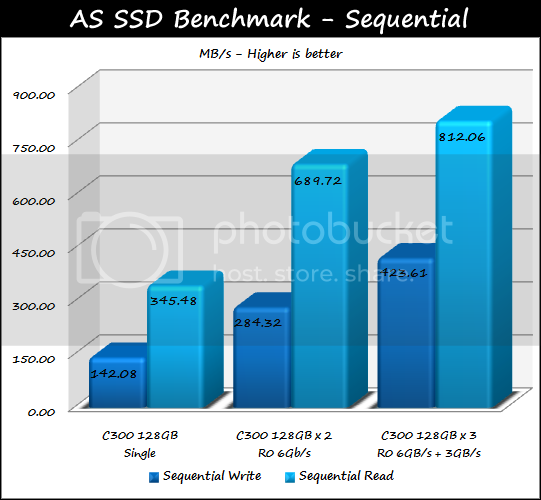 When you add a third SSD drive via 3Gb/s the increase is not as large, but still does add to the overall benchmarking performance of the array. These are blazing fast 4K results, reaching just over 845MB/s read speeds and 447MB/s writes! This is a very high score for a single drive, much faster than if this drive was used on a 3Gb/s port or a Marvell port on another board. RAID 0 with two drives is quite impressive as well, and adding a third drive at 3Gb/s brings the total score up an additional 400 points. With write scores topping off at 423MB/s and reads speeds of above 812MB/s, these results are outstanding! 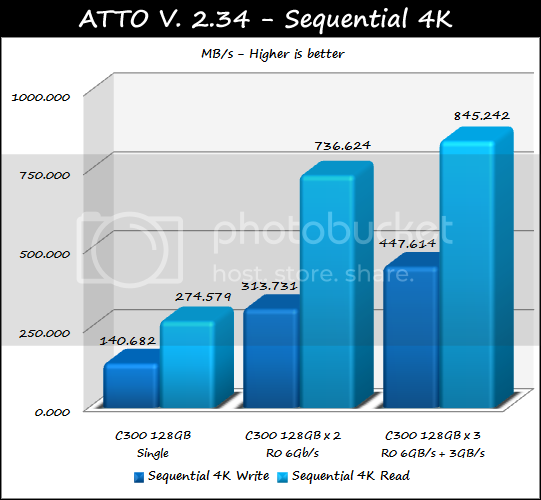 4K writes do not scale as well as other areas when adding additional drives, but the 4K reads here are great, when using 2 drives in RAID o at 6GB/s they are almost 1 1/2 times faster than a single drive. 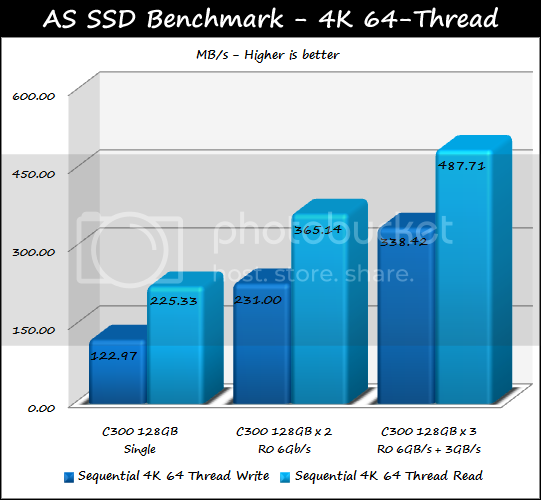 64-Threaded 4K speeds with the P67 chipset are also very impressive, when using two drives in RAID 0 at 6Gb/s this nearly doubles the speeds of a single SSD, and a third drive at 3Gb/s added to the mix gives another large increase in speeds too. 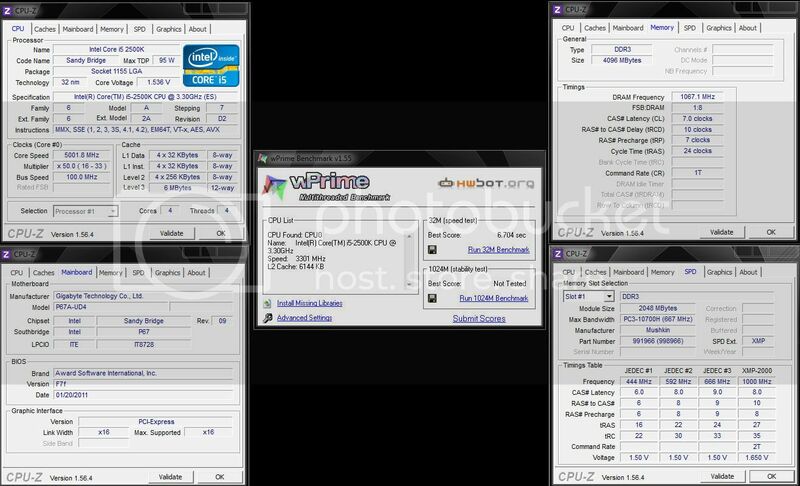 P67A-UD4 + 2500K Combo - Vcore set 1.225V BIOS, 1.224V idle and 1.212V load. P55A-UD6 + 875K Combo - Vcore set 1.420V BIOS, 1.418V idle, and 1.392V load. 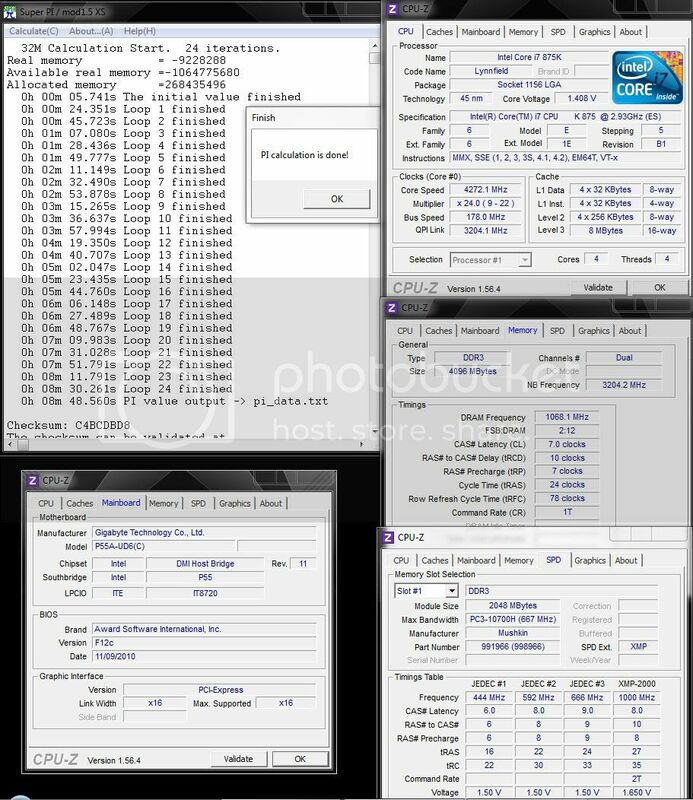 I was unaware until running these tests just how hot the 875K I have operates, it's a hot one for sure at the voltages required to run these speeds. So I apologize if these results look skewed in favor of the P67/2500K, as that was not my intention at all. 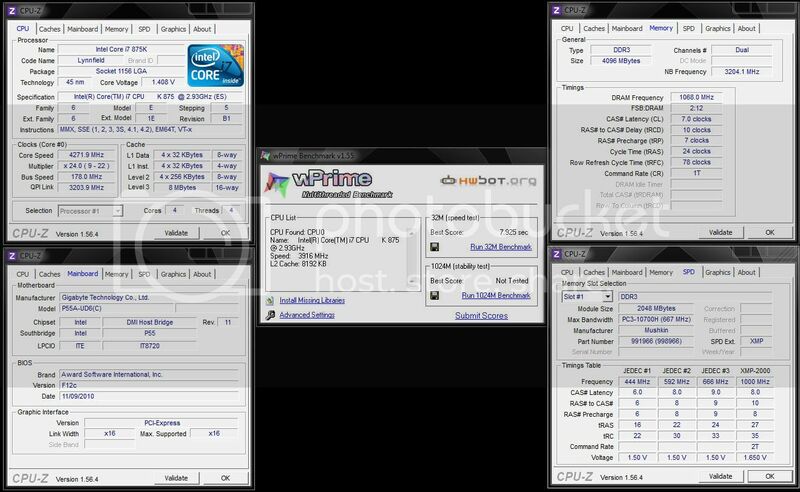 When idle at 4.2Ghz range, the P67/2500K combo ran at a very cool 25.00C, only ramping up to 56.25C under heavy LinX w/ AVX load. The P55/875K combo was about 10C warmer when idle despite the larger amount of voltage used, but once a load was applied it became very hot, very quickly, and topped out at 87C under LinX load. 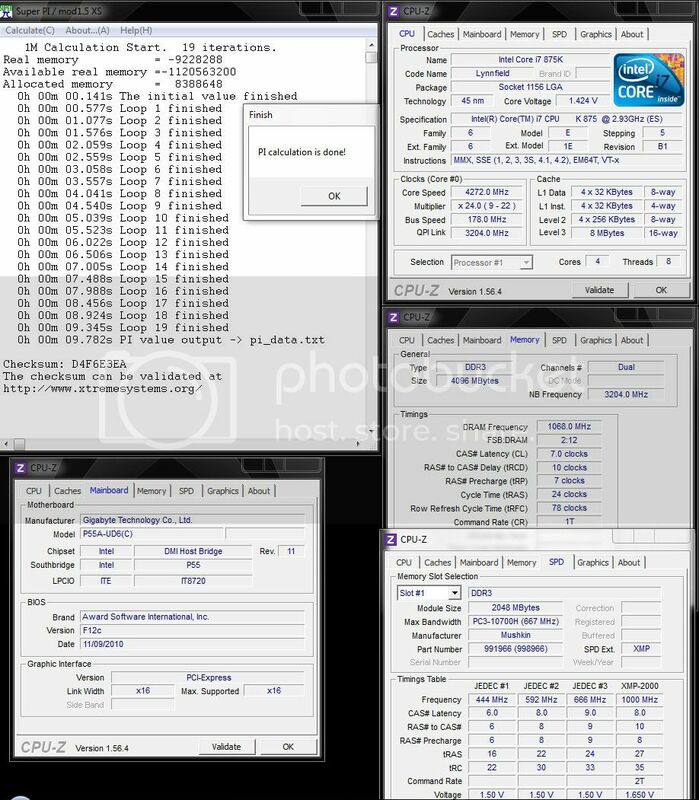 I did re-seat the CPU water block a few times on the P55 setup to ensure that the mounting was not causing these results, it was not and these are correct temperatures. 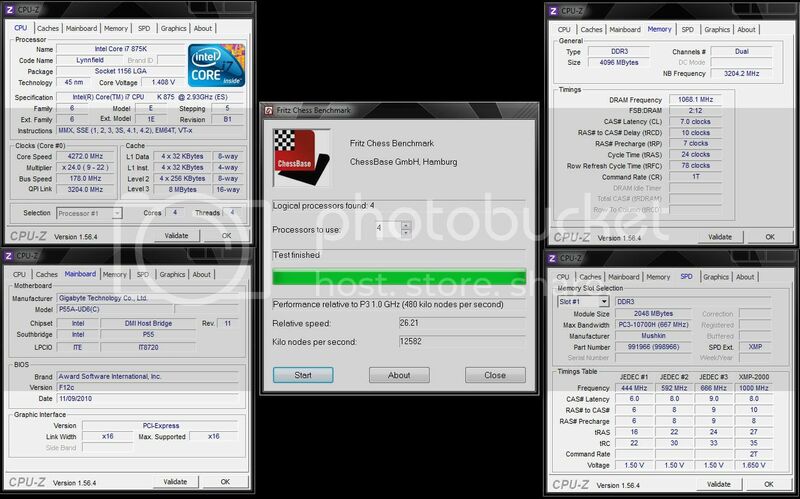 Overclocking on P67 is very limited, you can only overclock via CPU multiplier, or by FSB which is where the real limit begins. 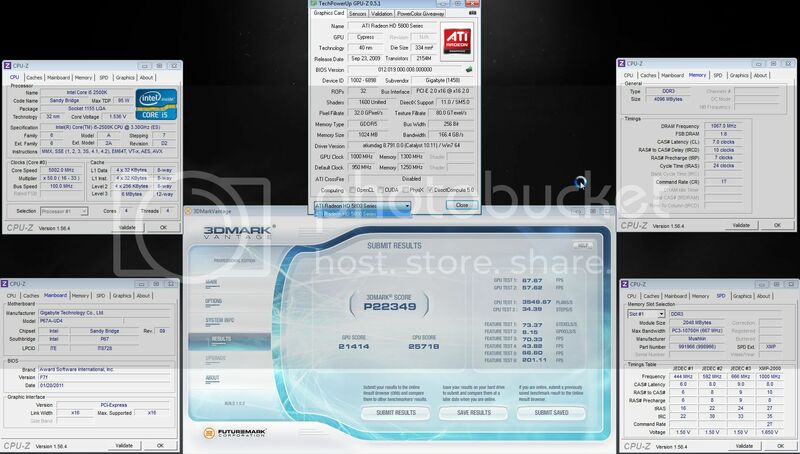 Some CPU's can overclock the FSB more than others, but most can only go from 100 to 105-108 or so. The K model 1155 processors have an unlocked CPU multiplier, but many struggle to reach above x50-52. 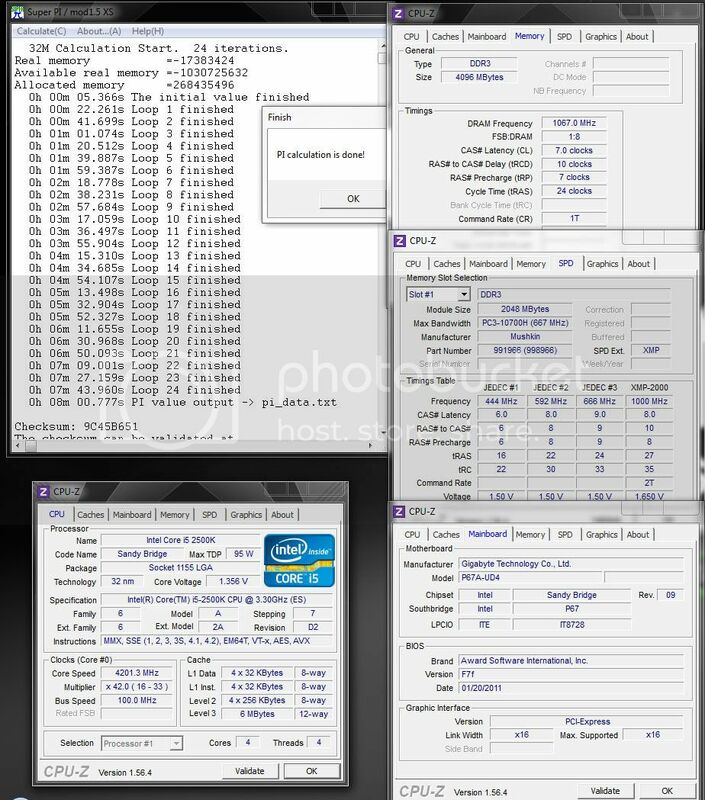 I have noticed a few users lately have found some CPU's that can reach x54-58, but those are few and far between, and I'm sure those users purchased many chips in order to find those golden ones that can reach x54 or above. 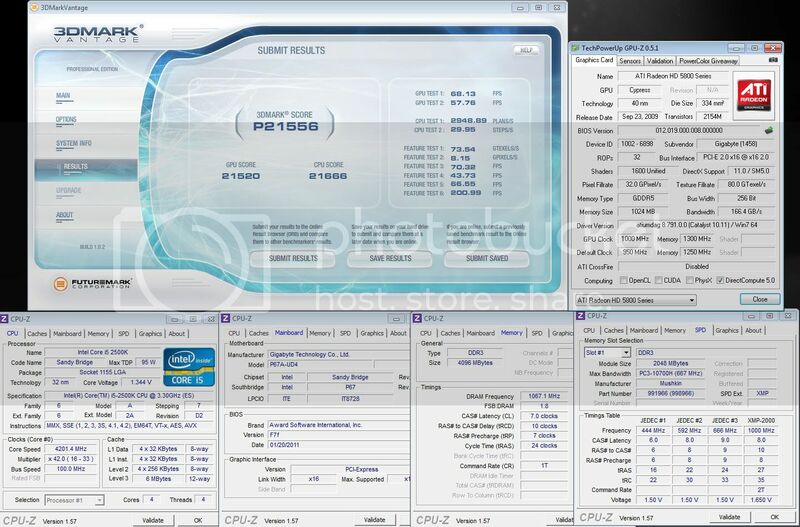 The ES CPU used for the main part of this test was only able to reach a x51 CPU multiplier, I choose to use x50 for this review in order to just to have a nice even number for comparison results. 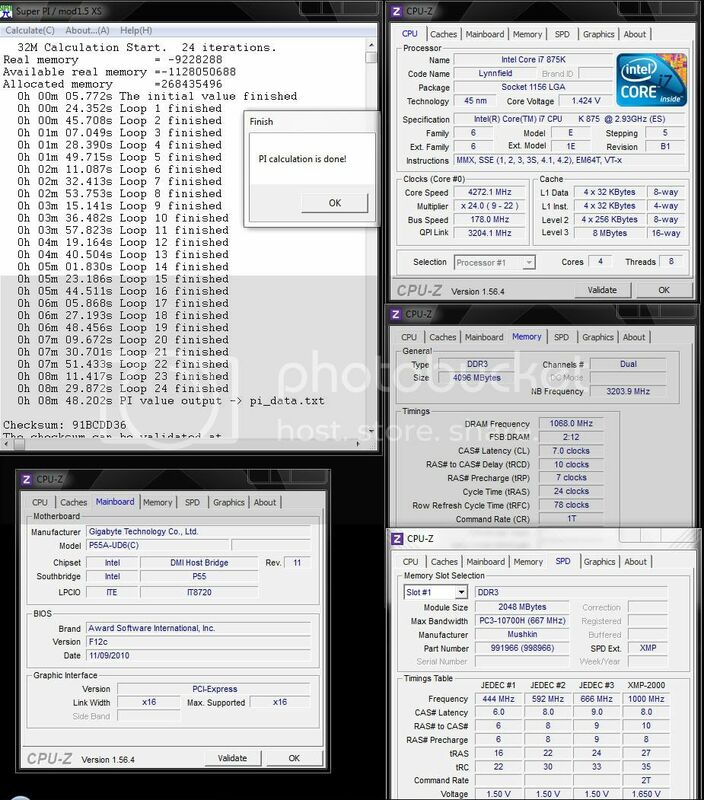 The retail CPU I later used for the temperature part of this review could reach x53 CPU multiplier on air/water and x54 on phase cooling. I was able to obtain the HWBot 1st Place Cup for this board in the reference clock submissions at 108.52 FSB, this is the highest FSB achieved and submitted to HWBot with a GA-P67A-UD4 motherboard. 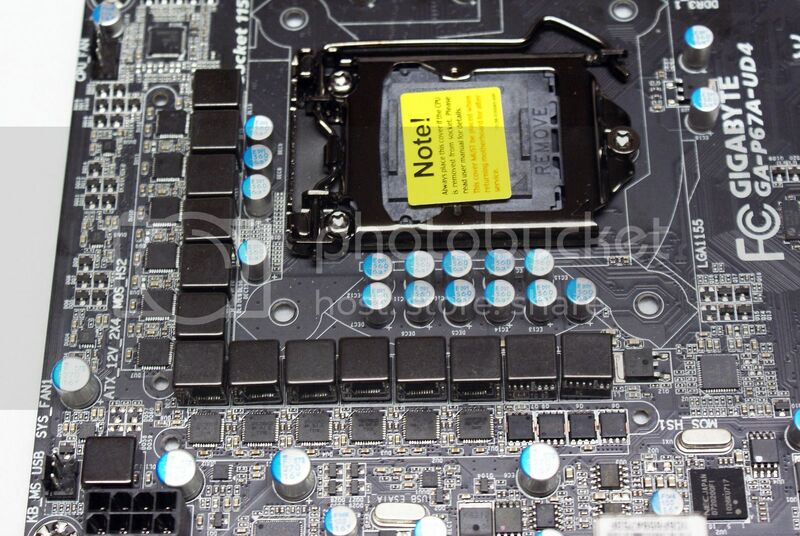 On Jan 31st, 2011 Intel disclosed that a manufacturing flaw had been discovered in it's latest Intel® 6 Series Express Chipset (P67 B2) , indicating that under normal operation the chipset could experience an issue with integrated SATA ports 2–5 that may result in these SATA ports experiencing a functionality issue over time. 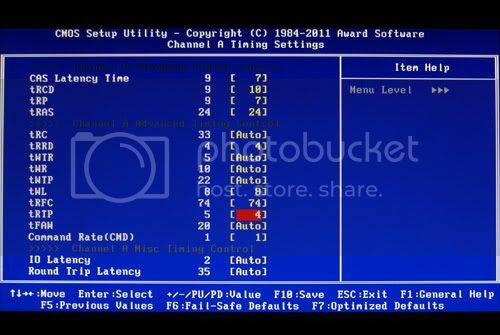 Systems with only integrated SATA ports 0 and 1 (6GB/s) enabled are not susceptible to this issue. Intel quickly issued a recall and motherboards and processors were pulled from shelves across the globe. 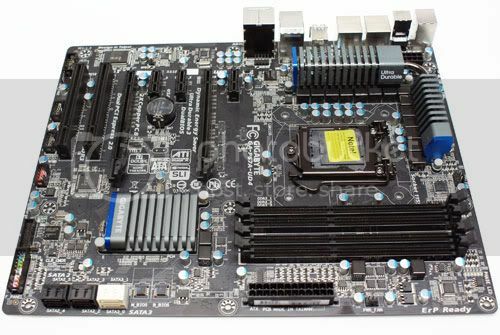 Gigabyte was quick to announce they had stopped motherboard production, and that their recall plans would soon be ironed out. On Feb 25th, 2011 GIGABYTE announced that they have redesigned their P67 motherboard lineup so that customers can easily distinguish between the B2 and B3 boards. Also mentioning that they have already started production on the new B3 boards, and that shipping of the P67A lineup would now resume with all new boards under the -B3 moniker. The new B3 motherboards are the same as the old B2 boards, with only a changed chipset, and in some instances a different audio codec. 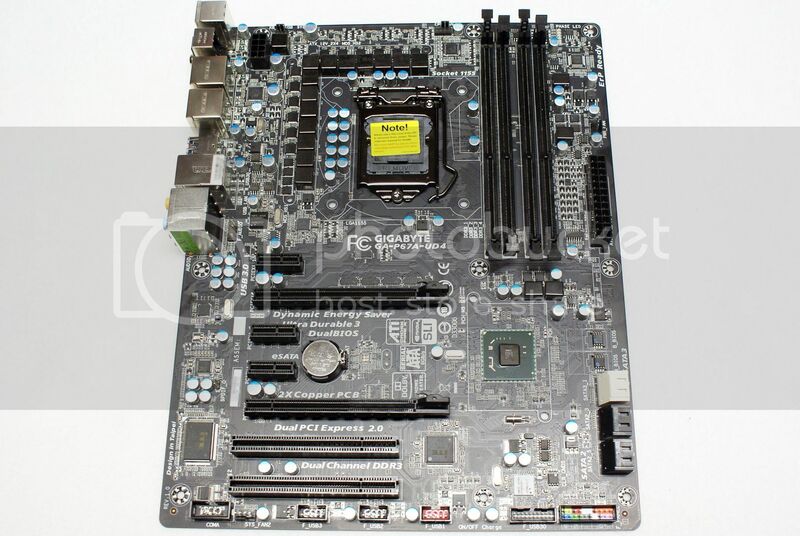 If you have a B2 board, you may start the replacement process with your place of purchase, or with GIGABYTE directly in the above linked news post. You may also continue to use your B2 board if you wish, however, if you do, it is suggested to use only the Marvell 9128 ports, or the Intel 6Gb/s ports. 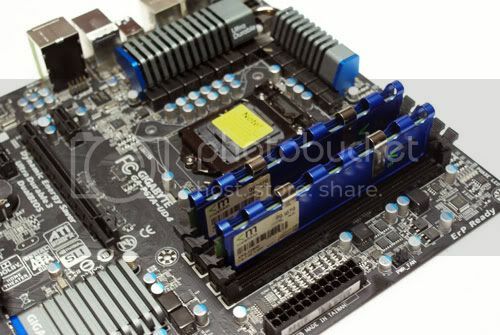 GIGABYTE Strongly urges users to get their boards replaced, so that you are not affected by this issue in the future. 1. New Matte Black PCB, looks very nice with the blue accents on the board. 1. Early BIOS has been a little quirky, but this is to be expected with new technology and I'm sure the kinks will be ironed out soon in future BIOS updates. 2. Not really a con at this price point, but personally I would give up a few USB connections in order to see an on-board power On/Off button at least on this board. 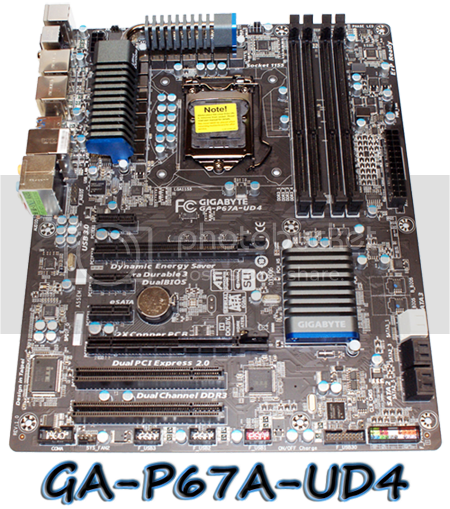 The GA-P67A-UD4 is a great motherboard for being a mid-range priced product, it offers many possibilities to end users and I would be happy to suggest this board to anyone looking for a great motherboard at a decent price point. 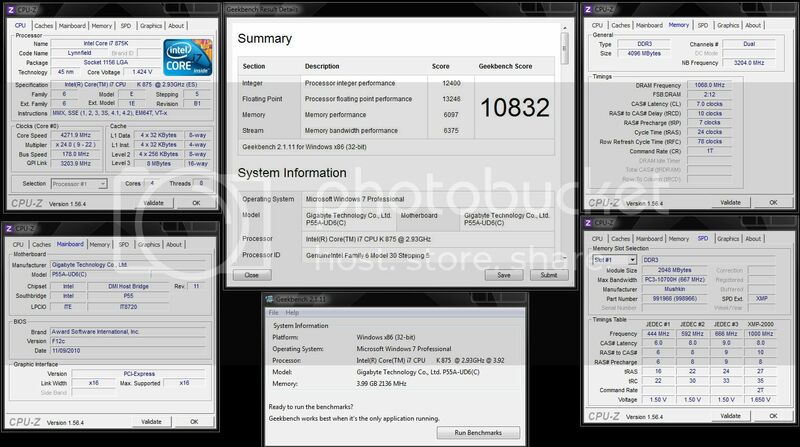 GIGABYTE, Crucial, and Mushkin for making this review possible! 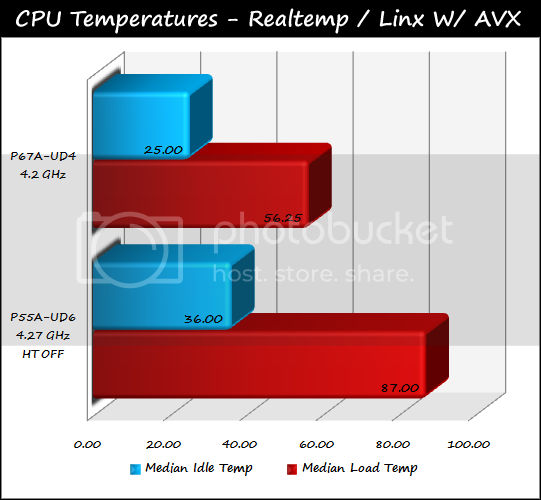 Have you tested LinX without the AVX update? That was a pleasant read,did you or can you clock to 5ghz on air with this mb/chip? I'm suprised by the memory read/write figures too,finally some Intel 6gb SATA ports!!!!! Thanks man, glad to hear you enjoyed it!! 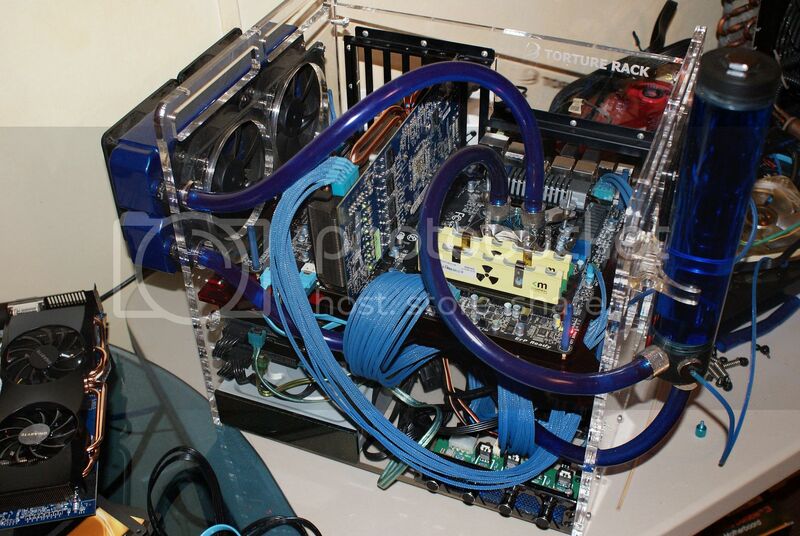 Yes, before I started my main work on this review I was using only the tiny Scythe cooler and was running 5Ghz and 5.1GHz no problem. Haha, that's what I said... Finally some 6Gb/s ports from Intel. Now we need 6 of them though, and TRIM in RAID - and they know it! 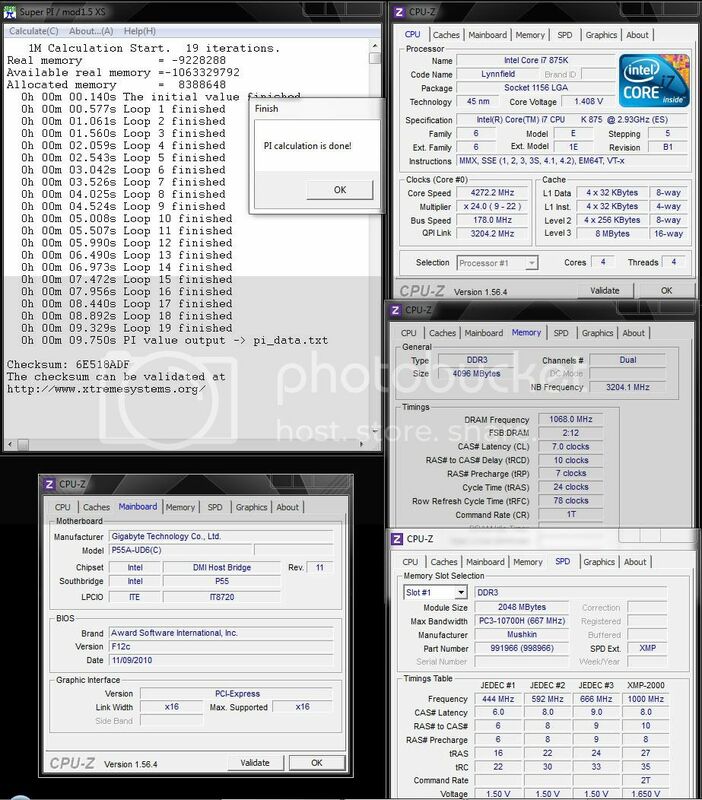 Ya man, P67 memory performance is amazing, and timings really don't have much effect either. At 2133MHz CAS 7 or CAS 8 is about the same, 6 too sometimes, it all really is dependent on the CPU speed more than anything else. At the same 4.2GHz if possible, otherwise can't compare. AVX suppose to be double SSE 4 according to wikipedia. 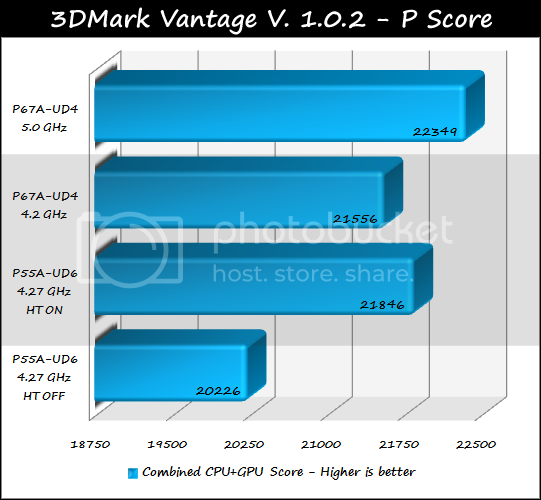 Will take some time untill applicatins will utilize AVX, but it sure beats any Core i7 9xxx. 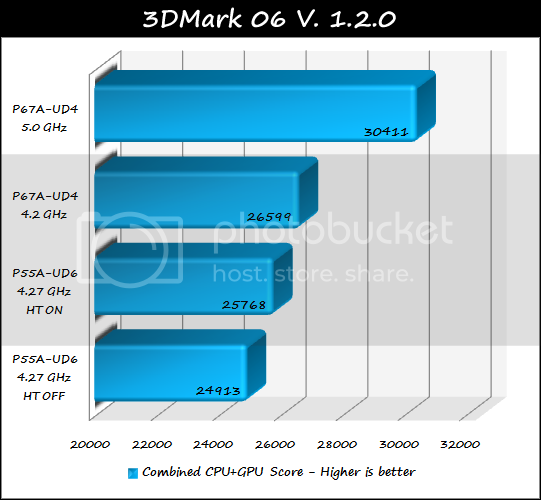 In post #2, is the CrystalDiskMark V. 3.0.0f benchmark result correct? Great Job on the review.